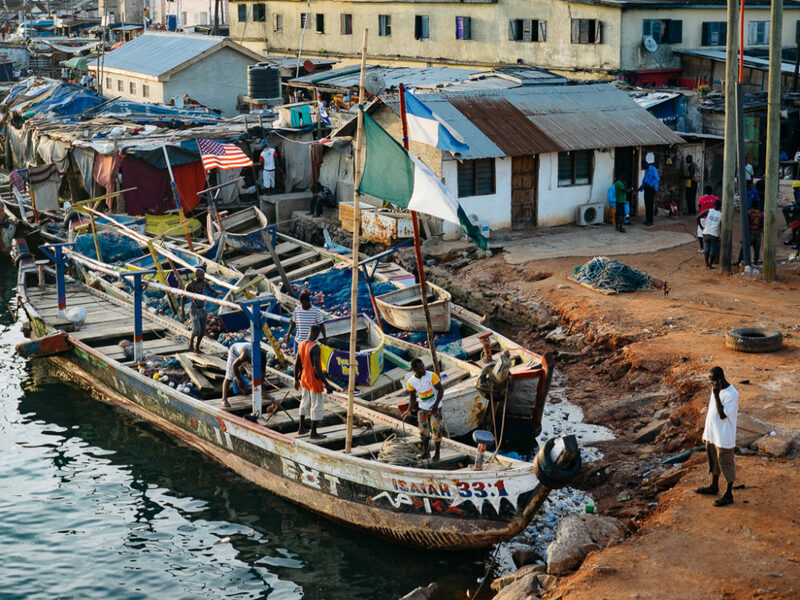 Less than a month after returning from Congo, I went to Ghana for business and had the chance to travel along the central and west coast. 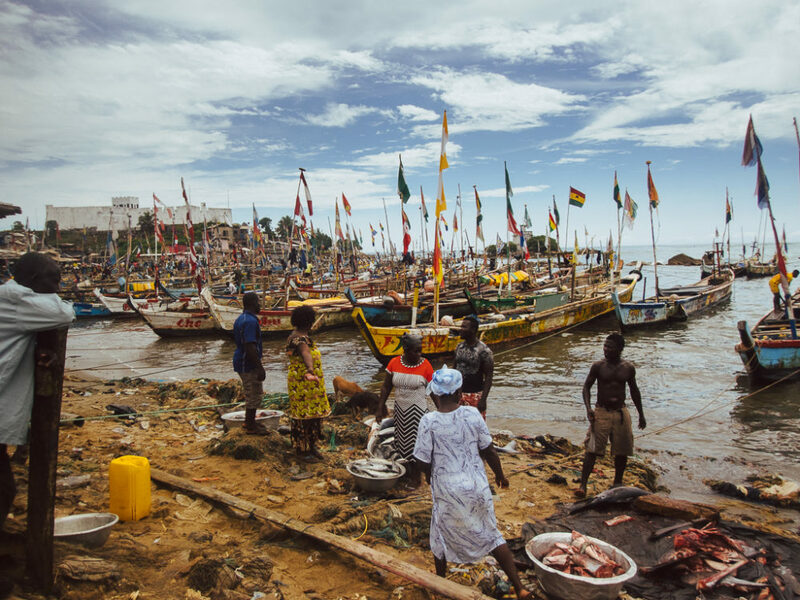 In three short days I dove deeper into the Ghanaian way of life and visited some lovely places. 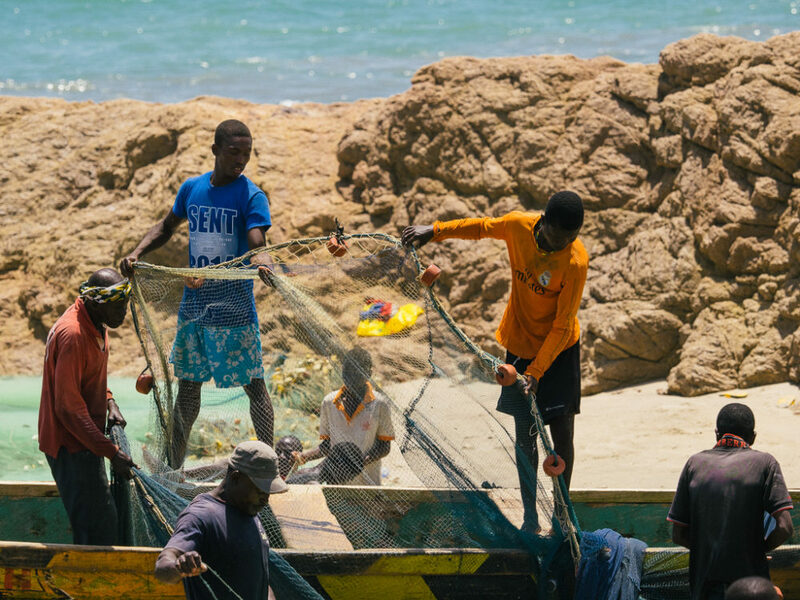 Ghana is not a popular destination for tourists and thus offers an authentic travel experience for visitors that want to understand how Africa lives and is transforming socially and economically. 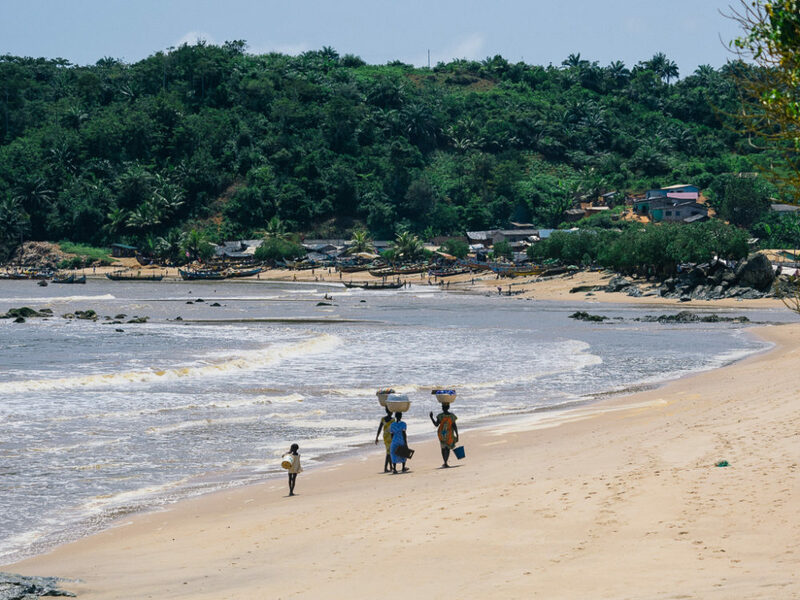 Cape Coast is a coastal town with a population of 170 thousand people, better known for the its castle, one of about forty “slave castles” on the Gold Coast (today Ghana). It was originally built by the Swedes for trade and later used in the trans-Atlantic slave trade. Slaves used to live here, under horrible conditions for periods that might exceed a month, before going through the “gate of no return”, the last stop before crossing the Atlantic Ocean. 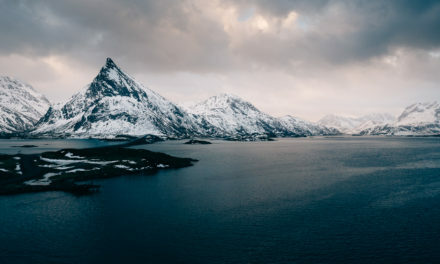 The slave trade worked in short like this: the local chiefs would capture the slaves and sell them to the European traders, who would put them through a-survival-of-the-fittest test and then ship the survivors across the Atlantic Ocean. during there stay in the castles, the captured lived in dark rooms in inhuman conditions. 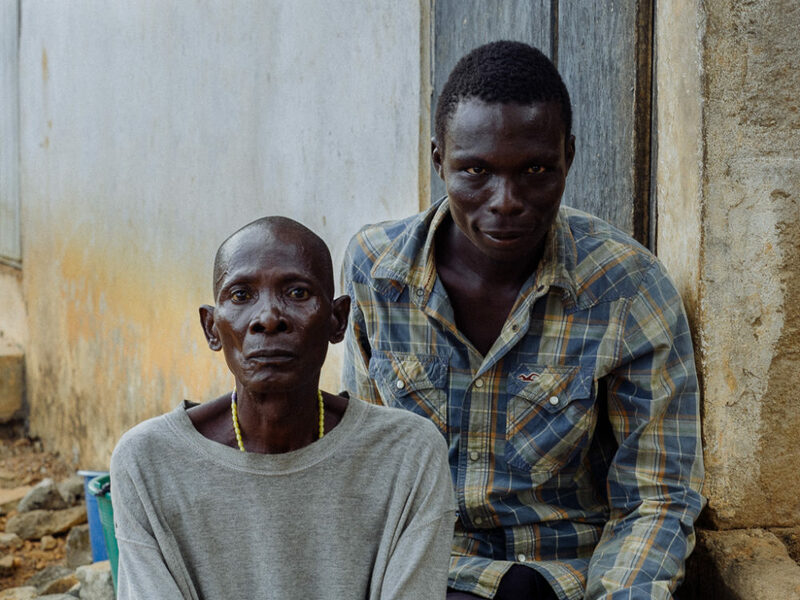 It was common to group 300 people in a dark dungeon that could normally host 30, with minimal food and water supplies and lack of even the basic sanitary facilities. Families were split apart and people from different parts were grouped together to avoid communication between slaves and potential revolts. This horrible activity, a disgrace for both Europeans and Africans. 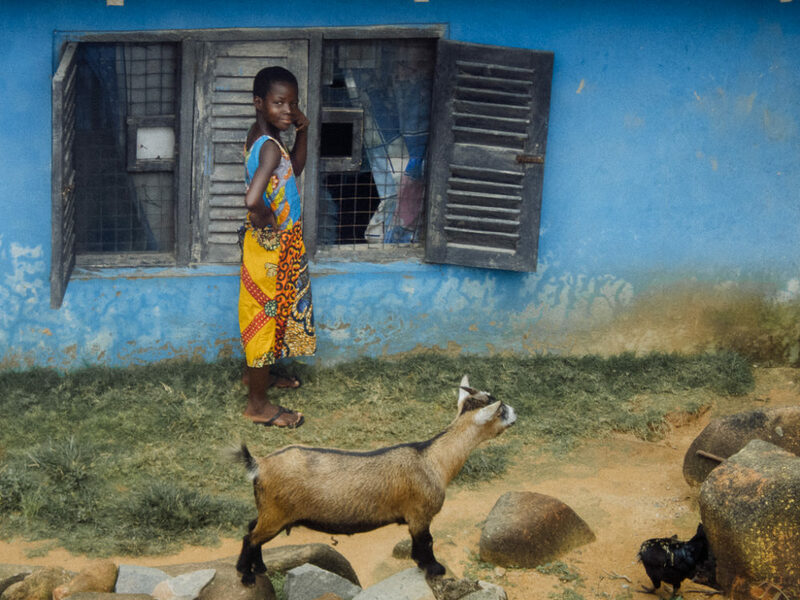 Slavery was prominent in Ghana and other European regions, long before the beginnings of the transatlantic slave trade. 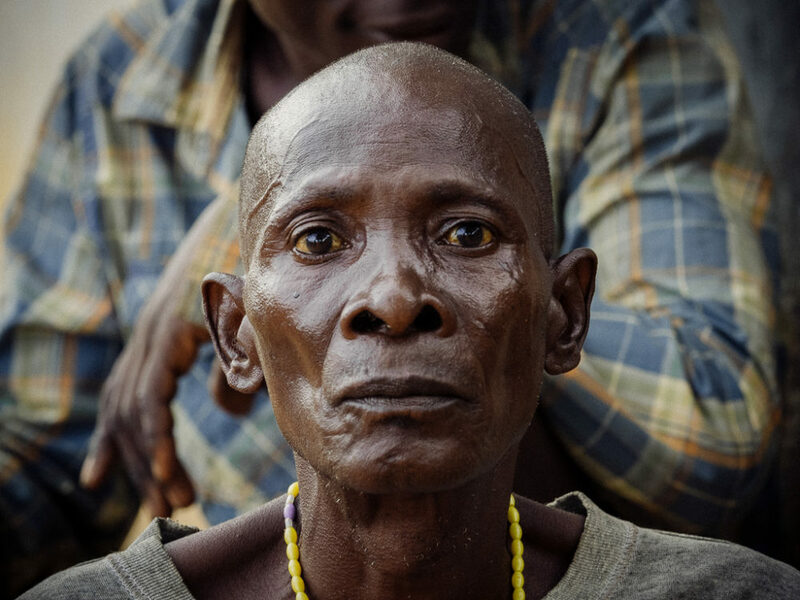 One in three people of the Ashanti tribe were enslaved locally. In some other regions up to thee quarters of the populations was enslaved. Of course this does not clear the Europeans from the stain of slavery. It is them that practiced the animal-like treatment of slaves and uprooted tens millions of Africans, to sell them like animals across the ocean. 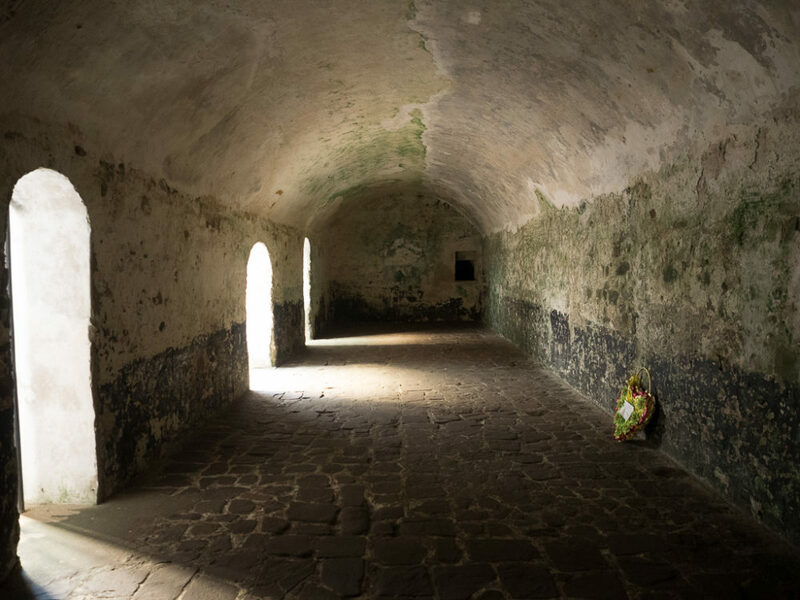 Inside the Cape Coast castle. The entrance to the male slave dungeon, where 300 slaves were kept for weeks in unhuman conditions. 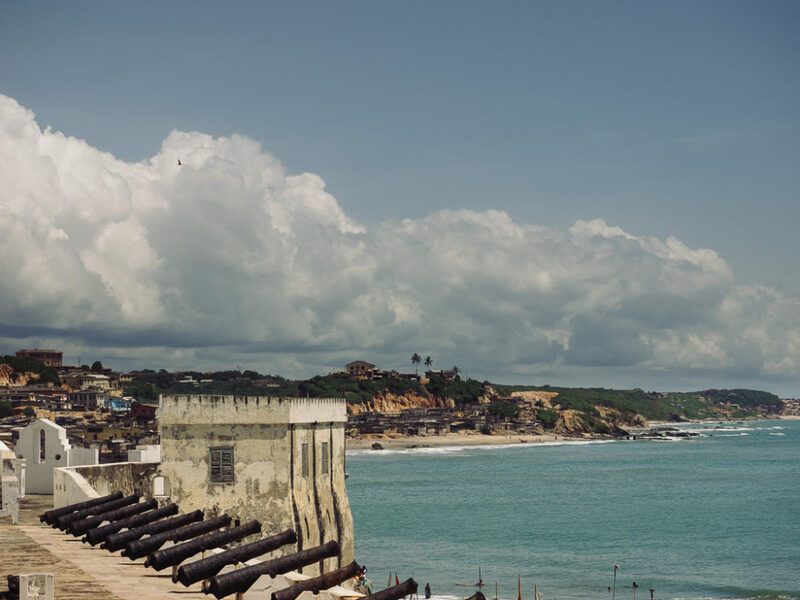 Seaside view form the Cape Coast Castle. 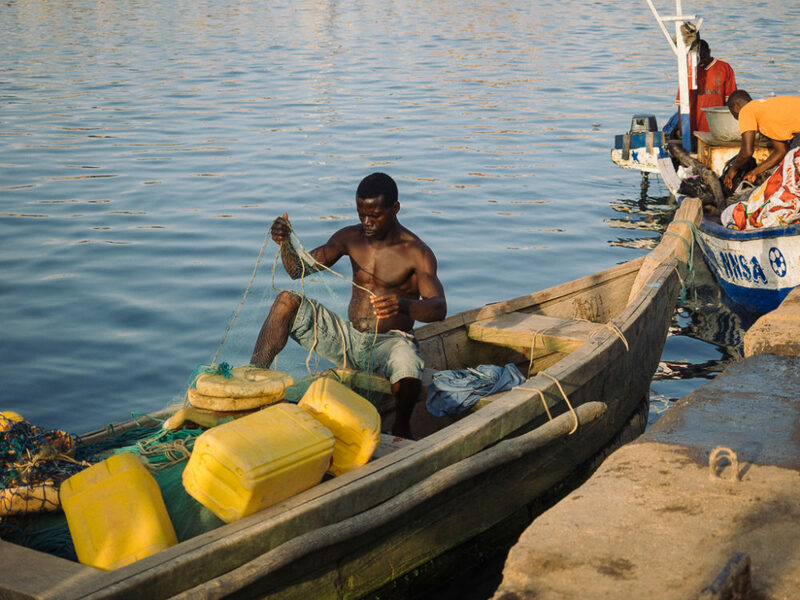 At the edge of the Cape Coast castle, overlooking the local fish market. 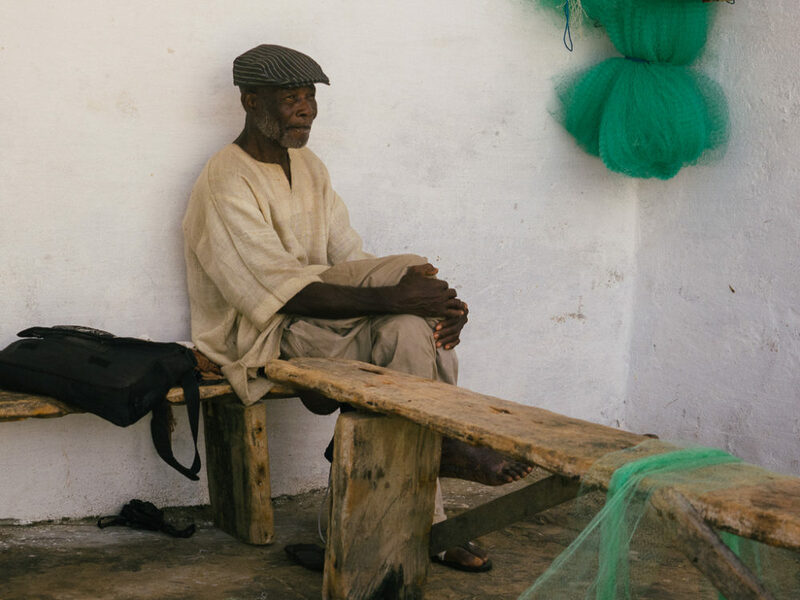 A cool guy resting right outside the "point of no return", at Cape Coast Castle. A lovely lady that works at the ticket office of the Cape Coast Castle, carrying her baby. 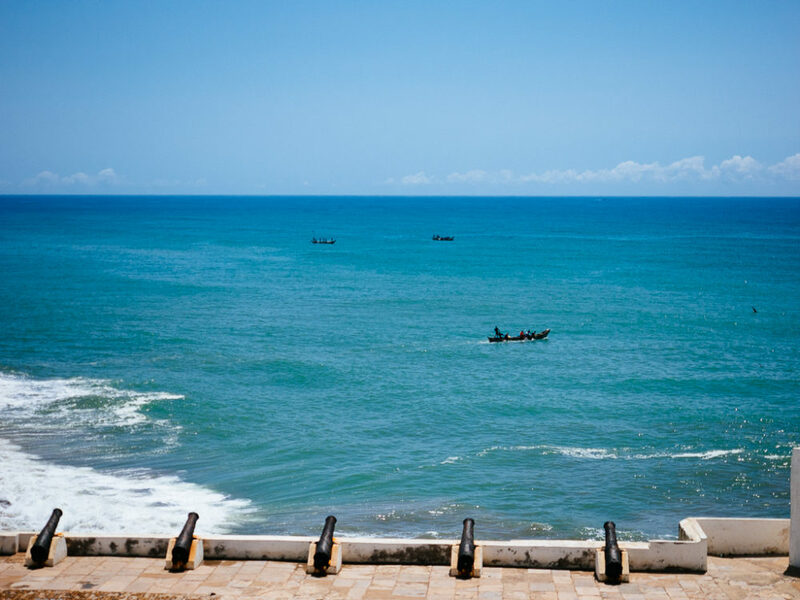 Ocean view from the Cape Coast castle. On the beach in front of the castle there is a busy fish and food market with dozens of fishing boats and hundreds of people. 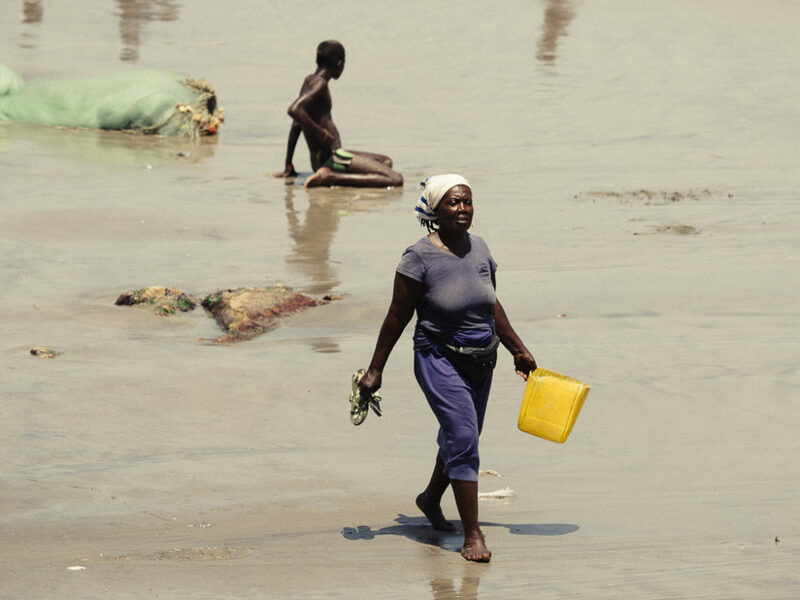 Fishermen unloading their daily catch, women shopping for lunch, kids playing on the beach. 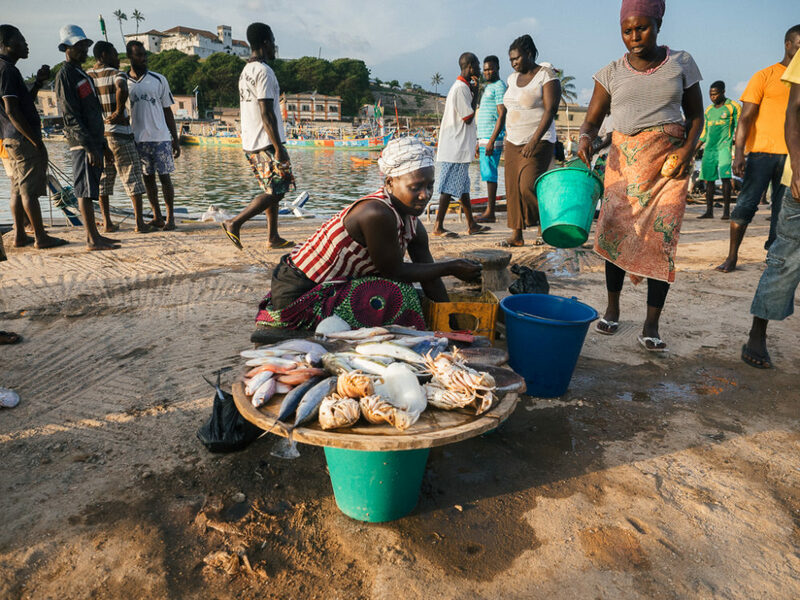 A busy fish and food market is taking place daily on the beach in front of the castle. 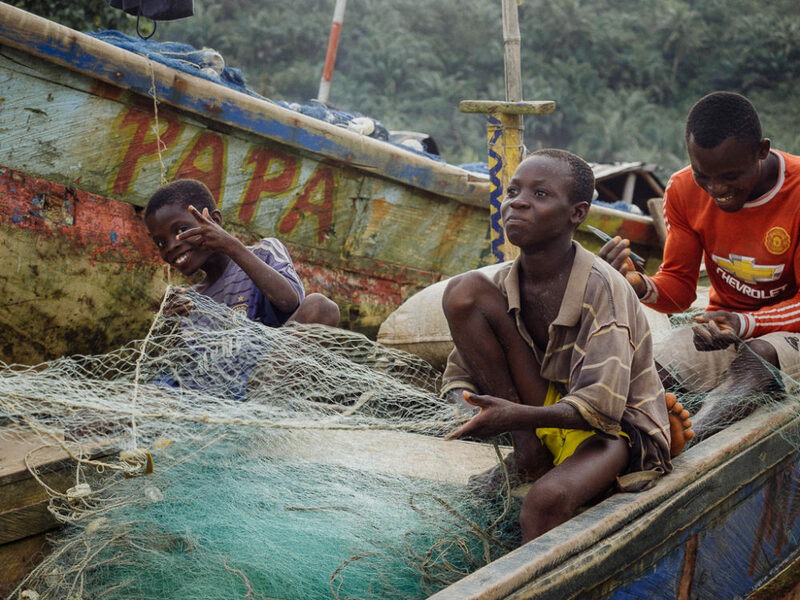 Young fieshermen tidying their nets in Cape Coast. 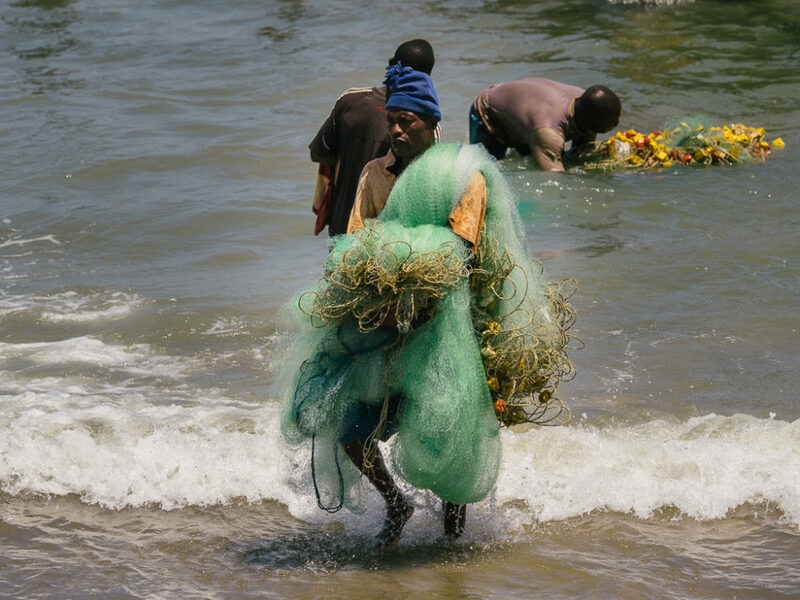 A fisherman carrying his fish nets from the boat. Two kids occupied with the fish they just caught. 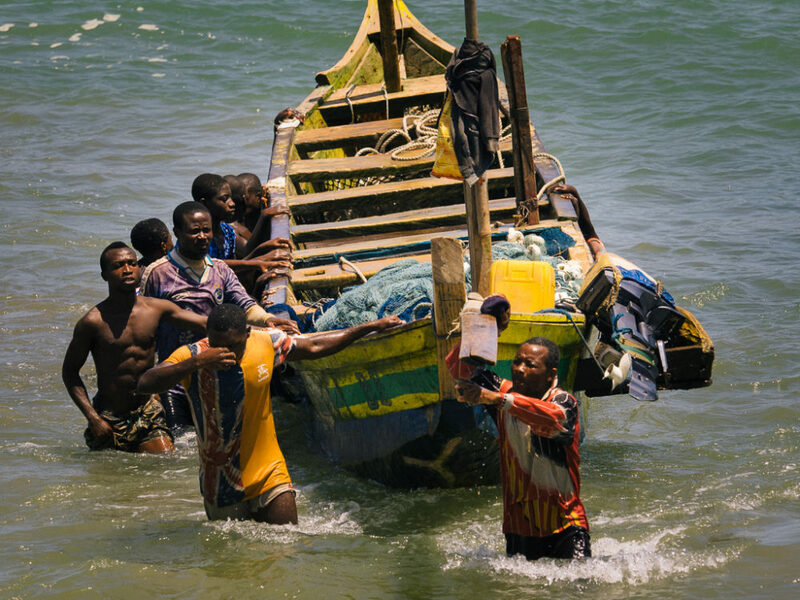 Fishermen in Cape Coast, guiding their boat back on shore, after a busy day out in the sea. 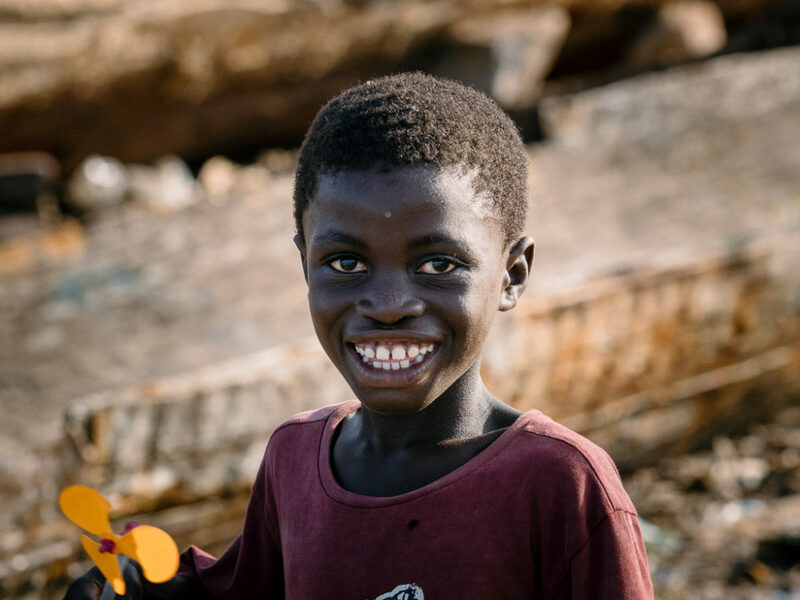 A happy young guy at the Cape Coast castle beach. 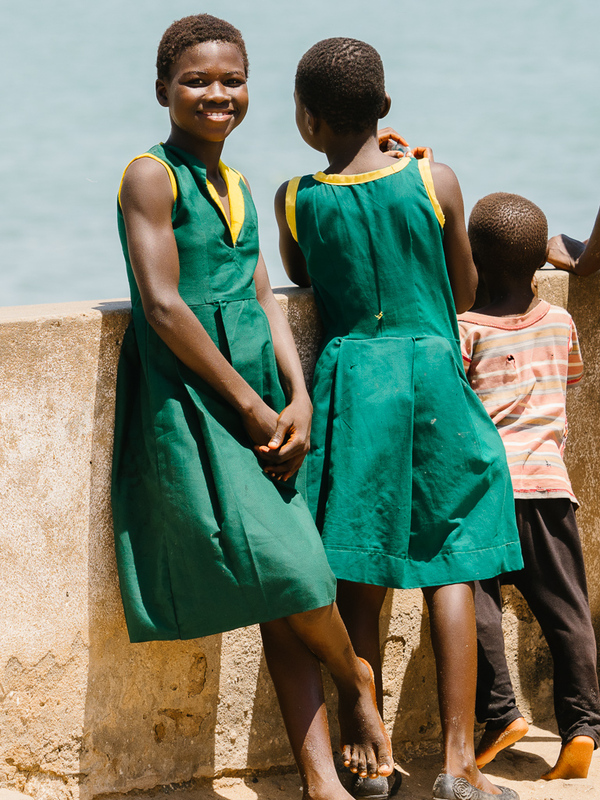 A lovely girls with her school uniform at the Cape Coast castle. 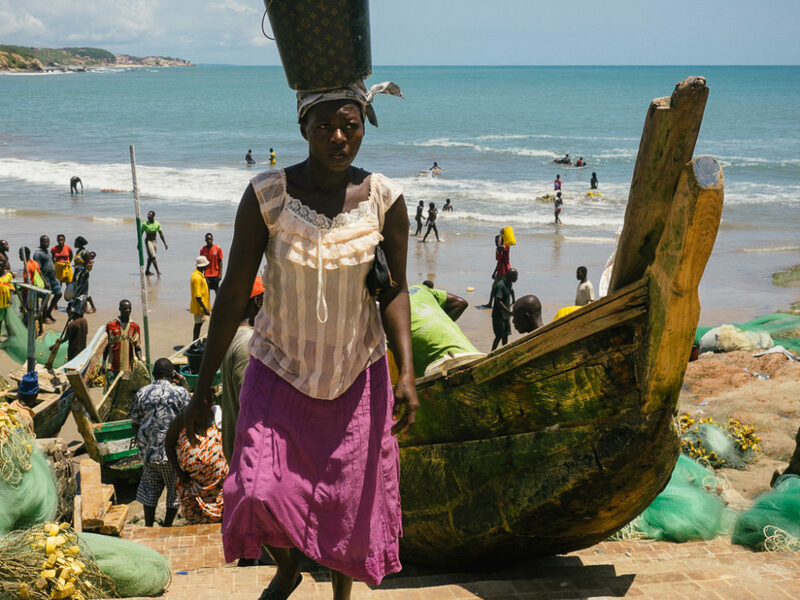 The beach in front of the Cape Coast castle is busy with people working, shopping or relaxing. 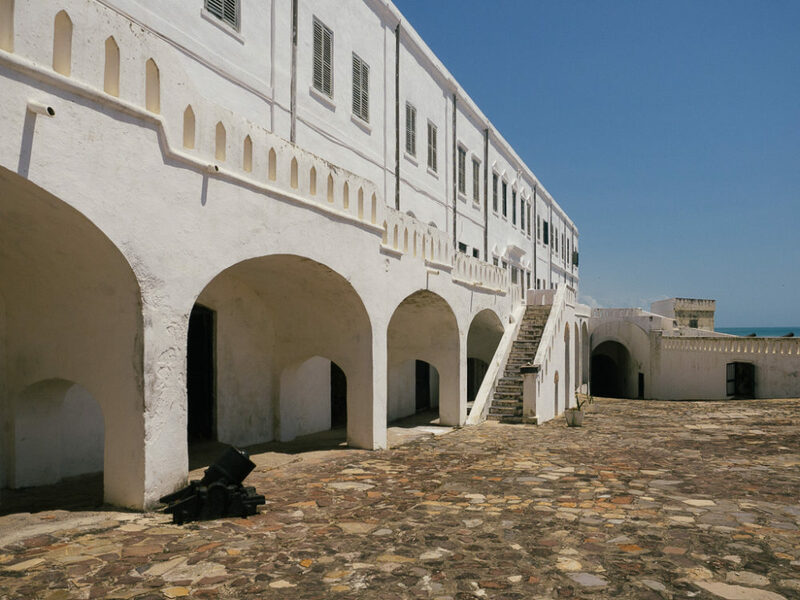 The Elmina castle was constructed in 1482 by the Portuguese, making it the oldest European building below the Sahara. 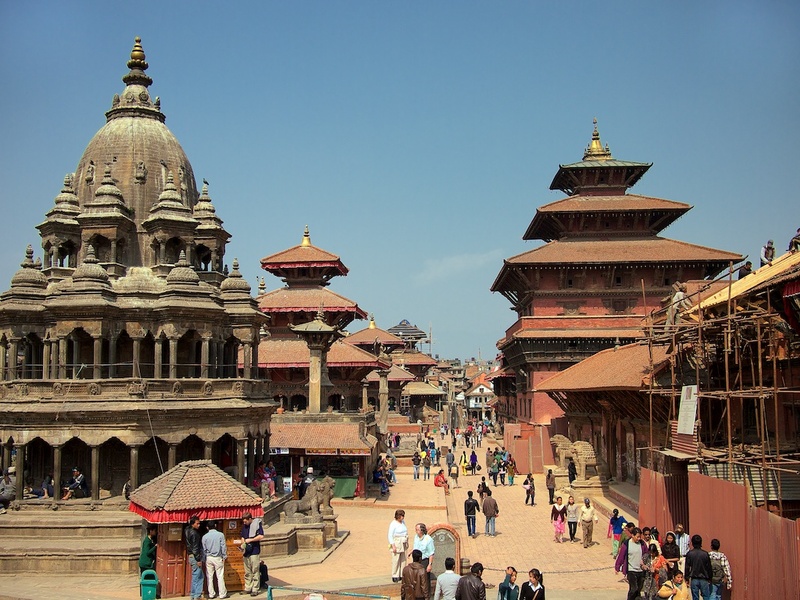 Today is recognized by UNESCO as a World Heritage Site. It was used in the Atlantic slave trade, like all the coastal castles in the region, initially by the Portuguese and then by the Dutch. In 1814 the Dutch abolished the salve trade and in 1872 turned the territory and the castle to British. 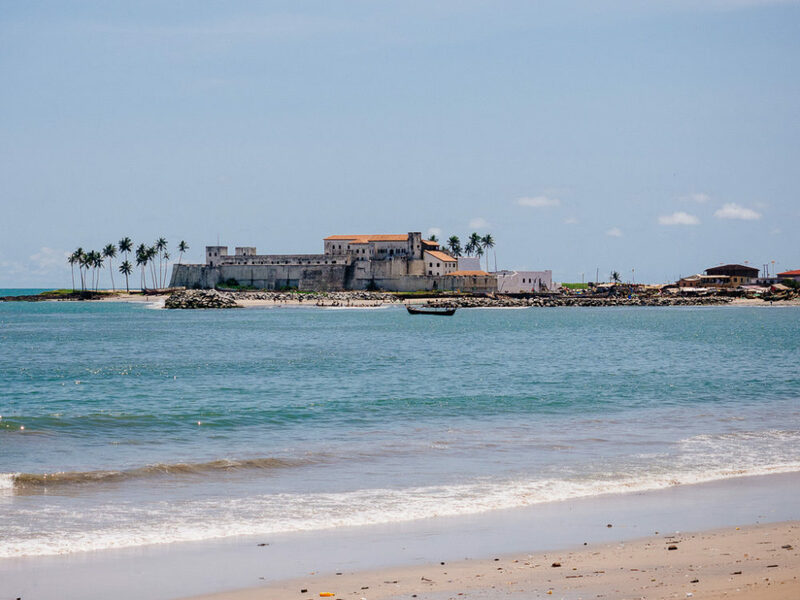 The Elmina Castle, erected in 1482 by the Portuguese. A slave dungeon in Elmina. The openings on the right were closed and no light was coming in. 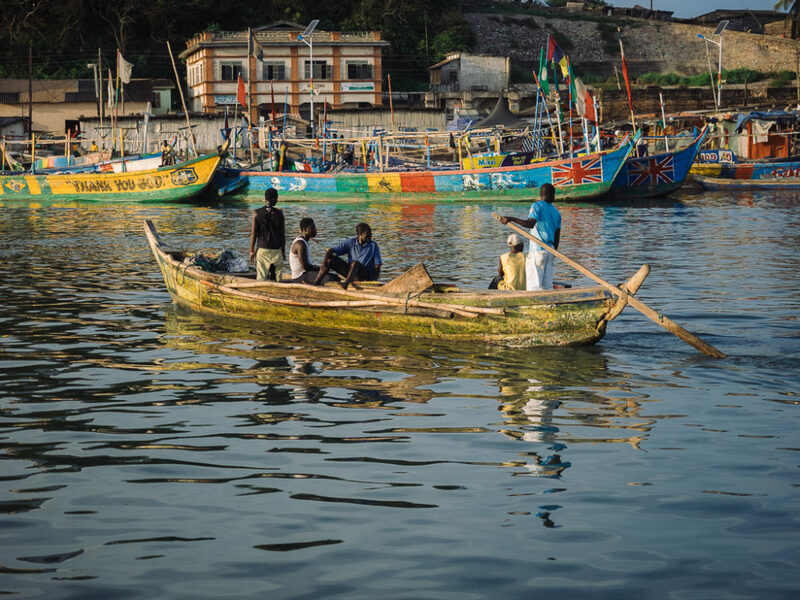 Next to the castle, there is a long sea canal, hosting a buzzing fishermen community and fishing market. 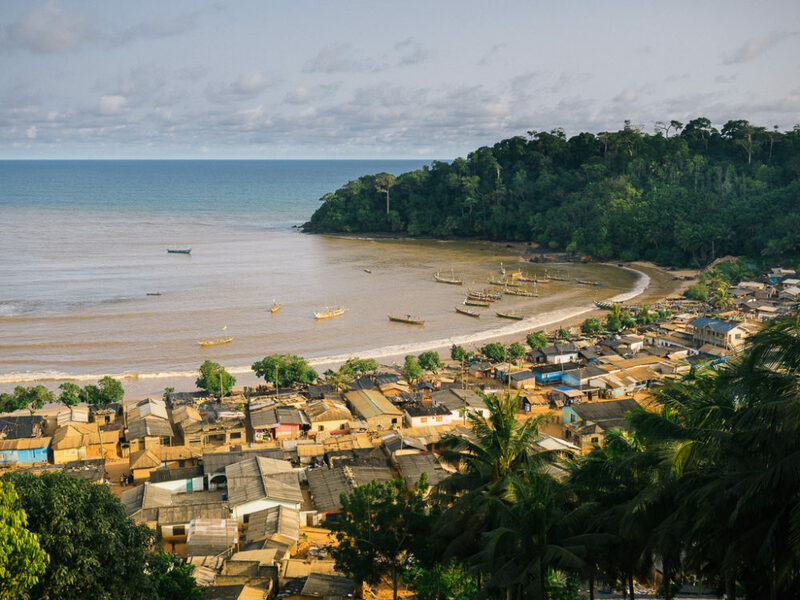 This is the most beautiful part of the town and gets especially attractive right before sunset, when the fishing boats return and the fish activity peaks. 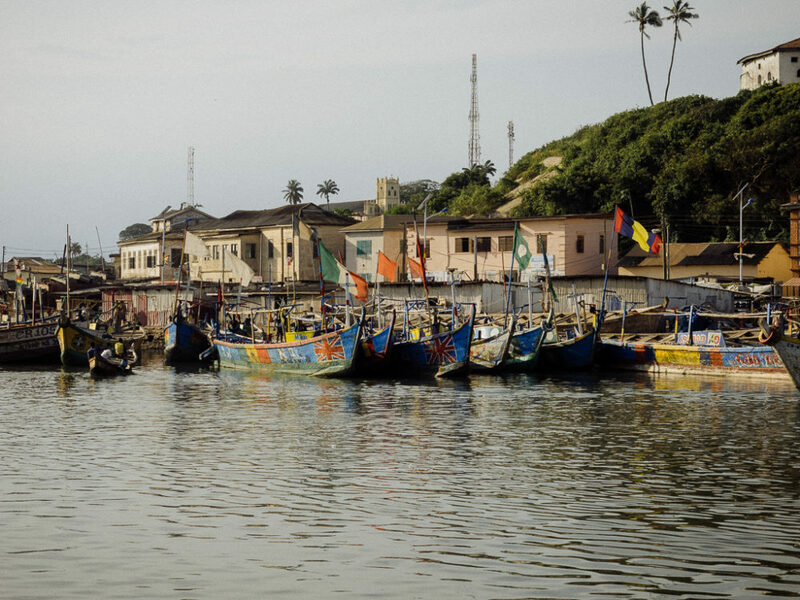 Fishing boats at the lagoon in Elmina. 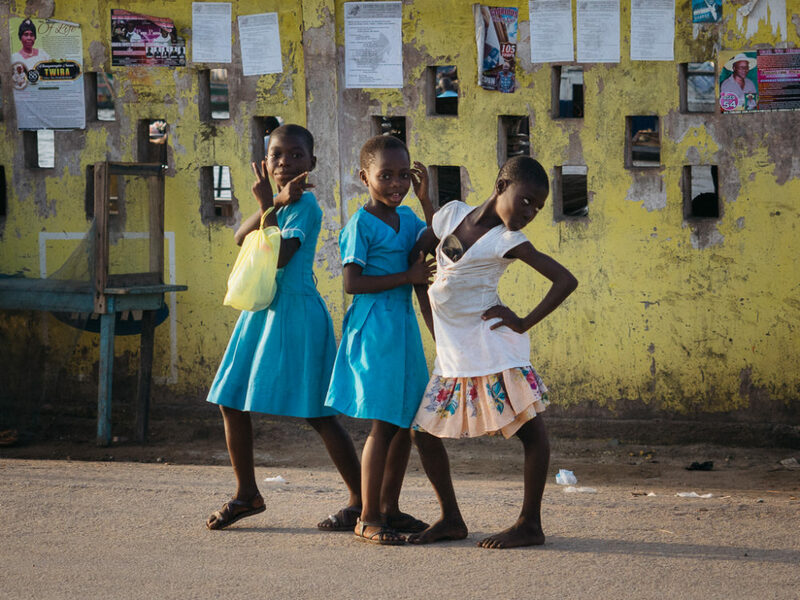 Three lovely girls, posing like pros in Elmina. 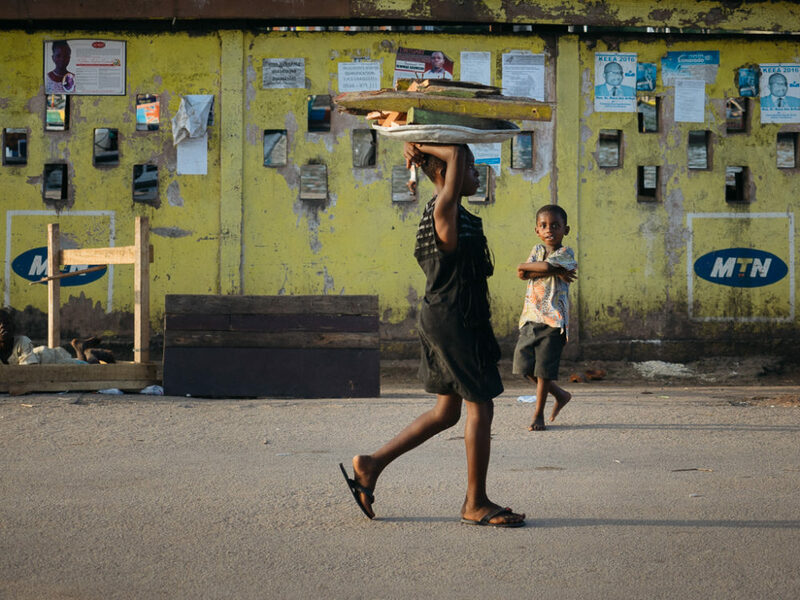 Outside the fishing market in Elmina, a girl carrying wood back home. 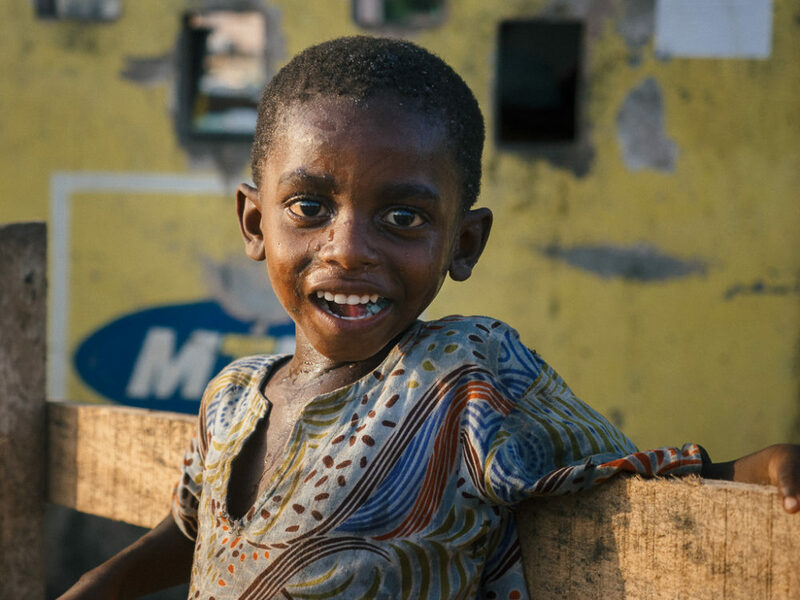 A Ghanian kid with huge eyes in Elmina. 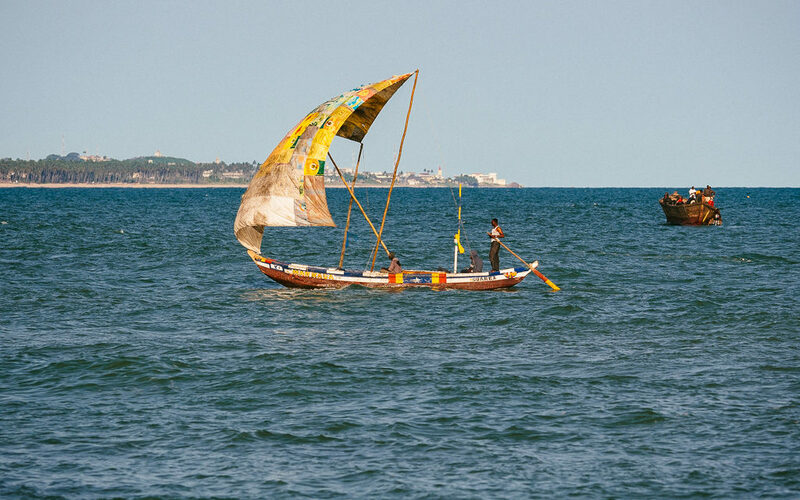 A fishing boat returning to the Lagoon, from a day fishing. 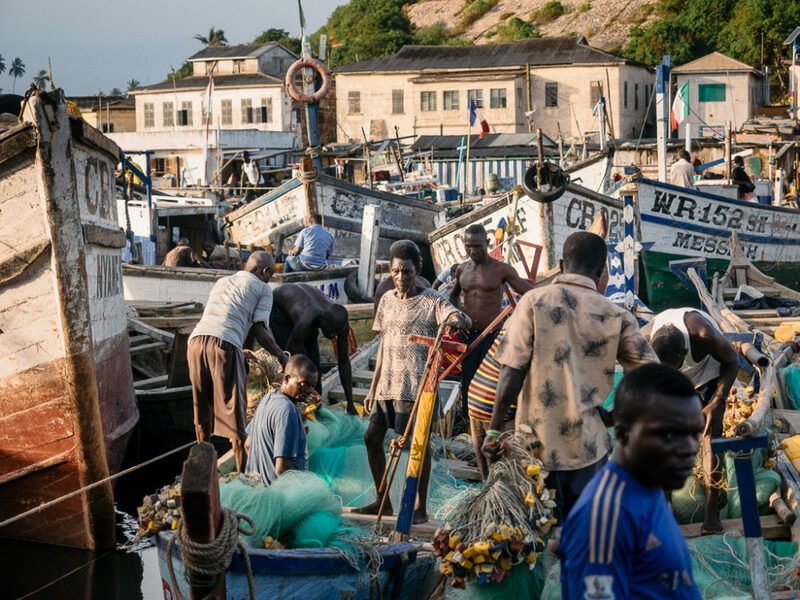 The fishing market in Elmina. 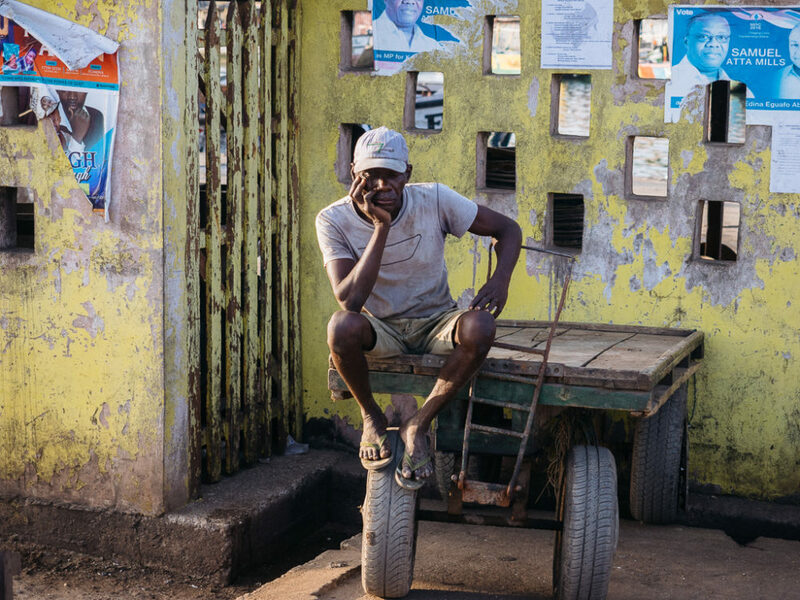 A guy outside the fishing market in Elmina. 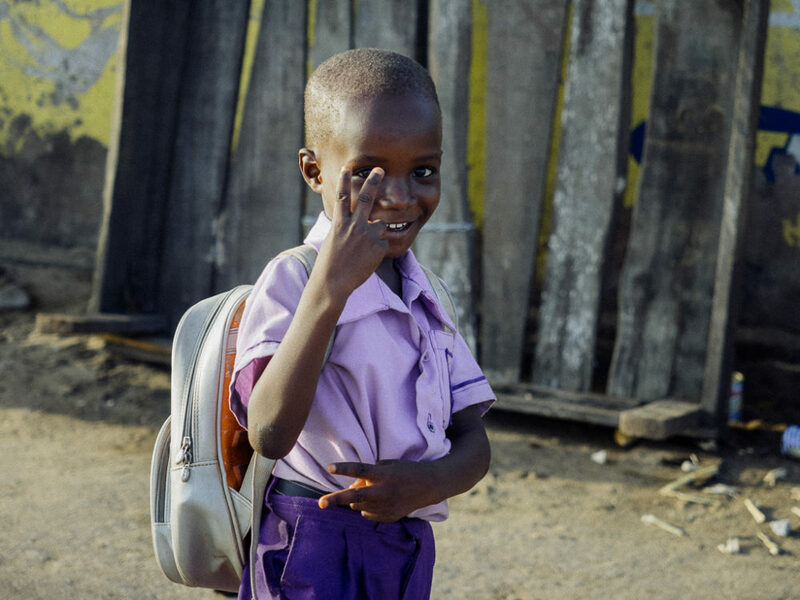 A kid waving me at me in Elmina. 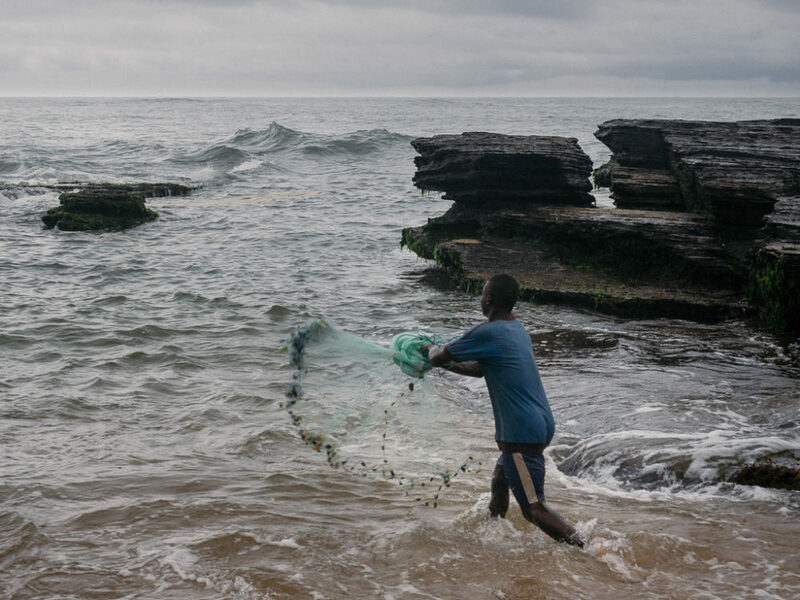 A fisherman fixing his nets in Elmina. 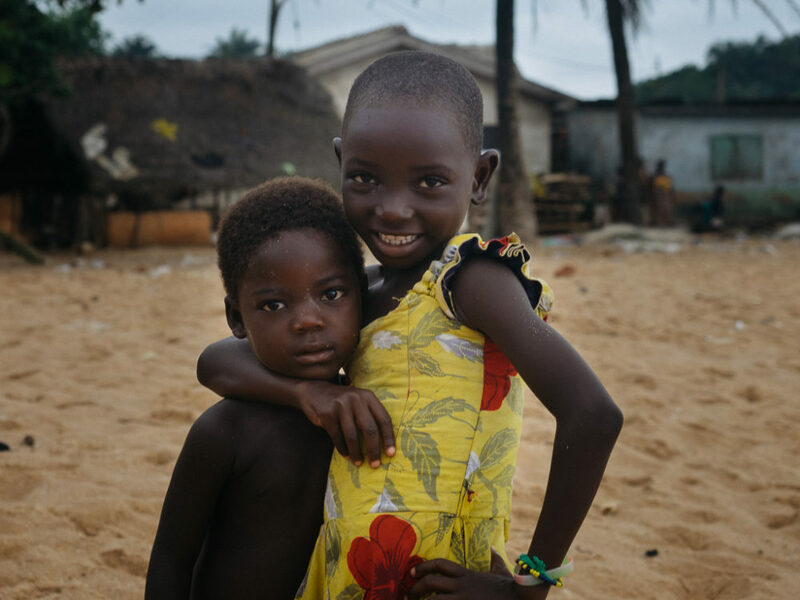 A boy and a girl facing my camera in Elmina. 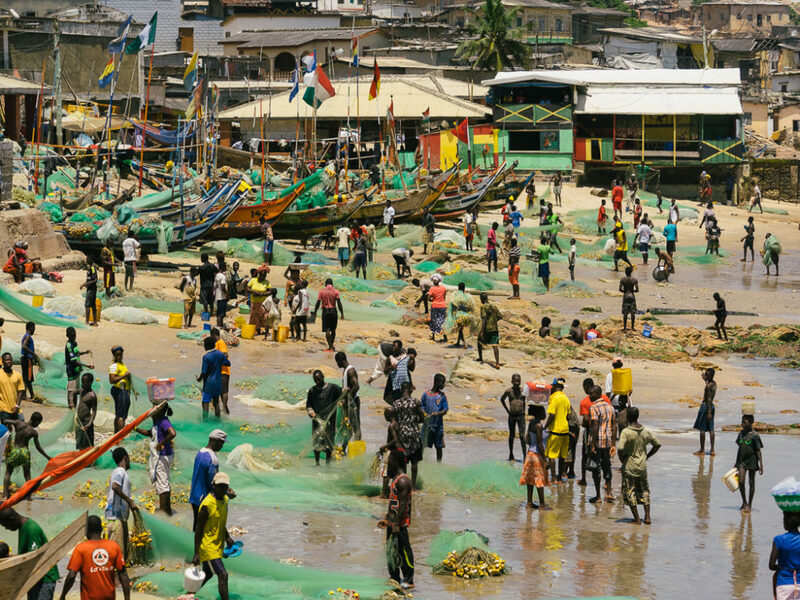 Busy fishermen at the Lagoon in Elmina. 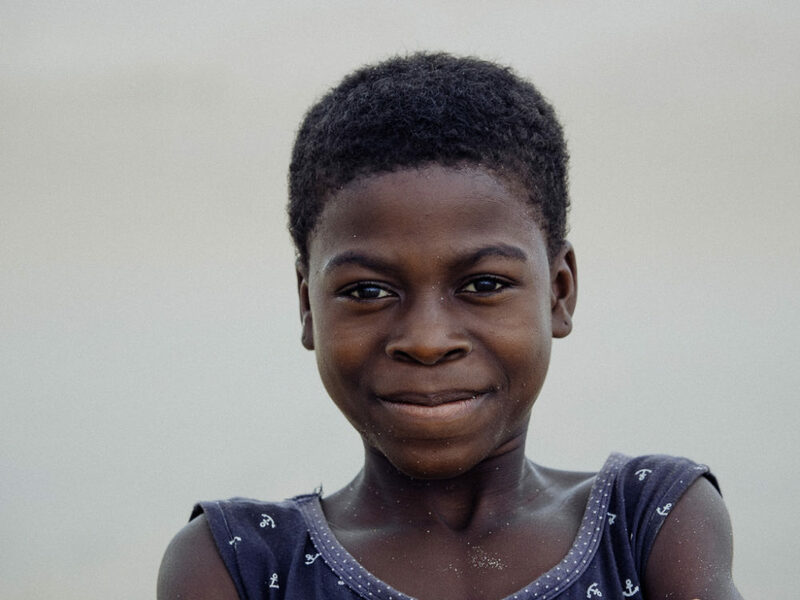 A Ghanaian boy smiling for me in Elmina. 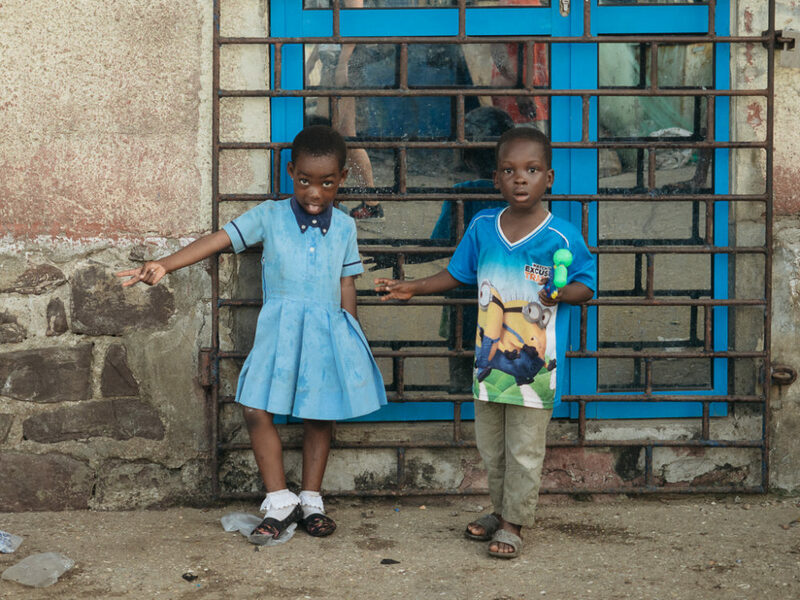 A couple of kids at the fish market in Elmina. 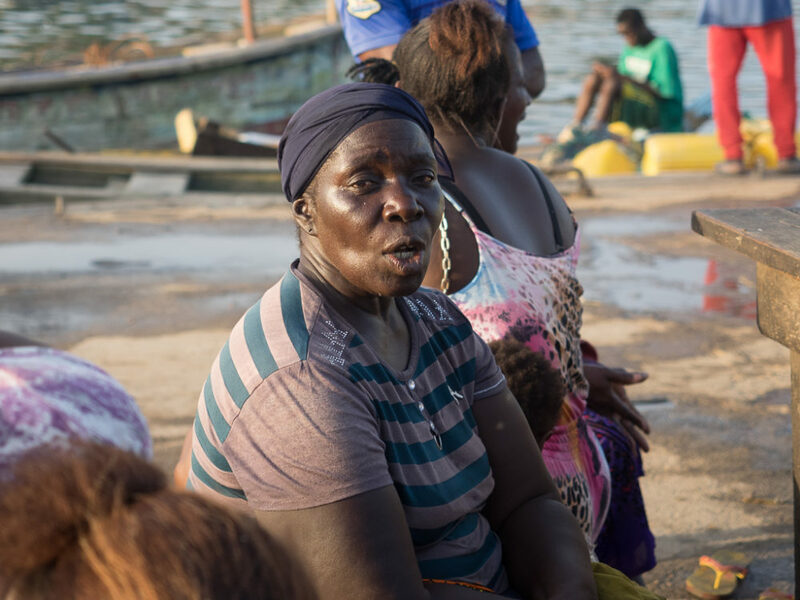 A local lady in Elmina's fish market. 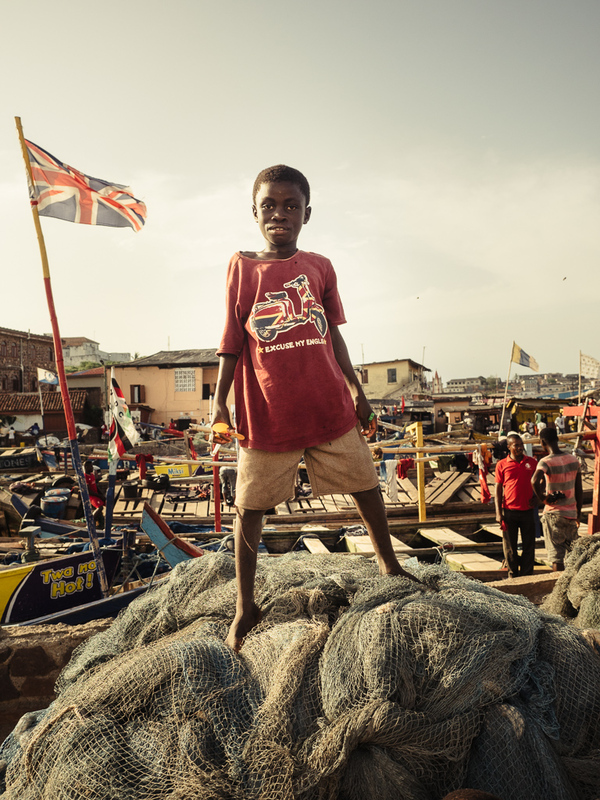 A young guy posing in front of the British flag in the Elmina fish market. 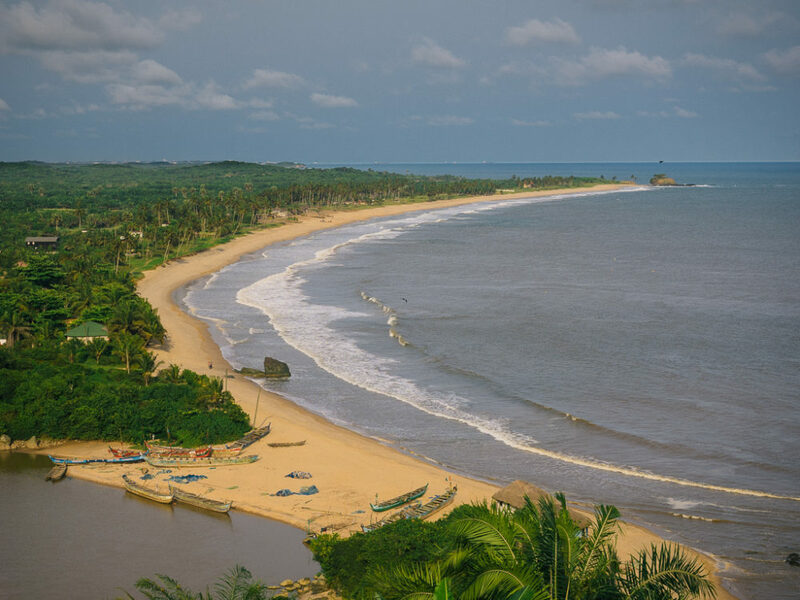 About 100km west of Elmina, right past Takoradi, there is a wonderful stretch of golden sand. On both ends there are two fishermen communities and in between two lodges. The Hideout Lodge is very nice, offering decent rooms, good food and the opportunity for some serious relaxing time. 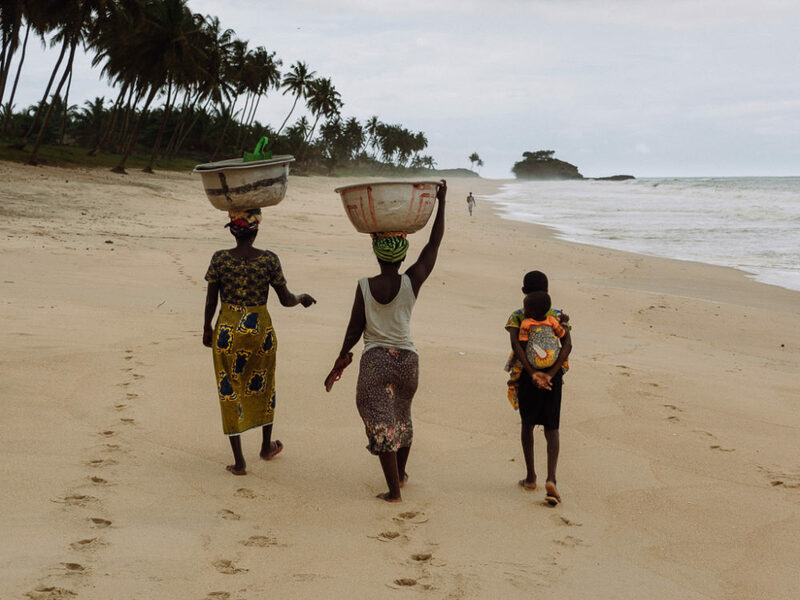 The beach is arguably the best in Ghana. Long, beautiful and empty of people. 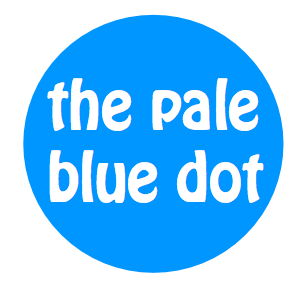 The only issue is that the nearby river empties large quantities of earth material form the jungle that turns the ocean yellow and muddy. Yet the waters are very clean. The wonderful beach at Butre. 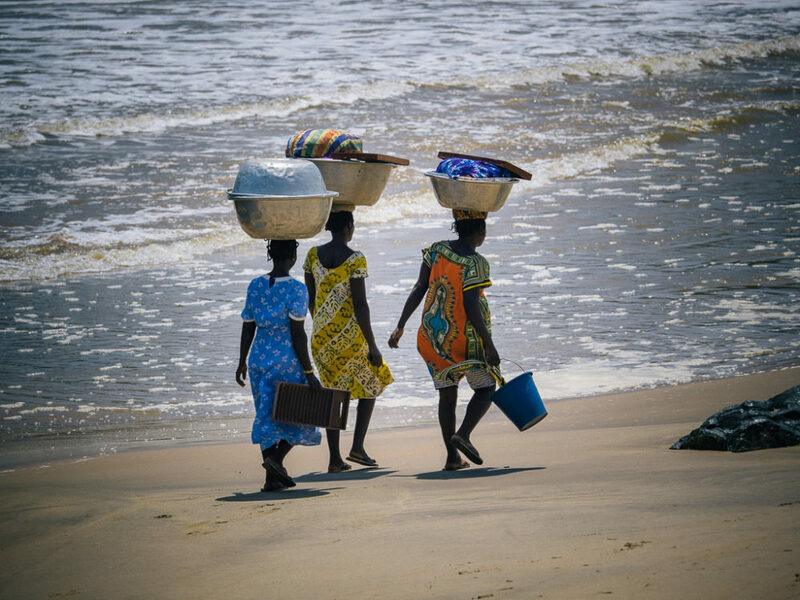 Three women carrying their stuff, back home, at the Butre beach. 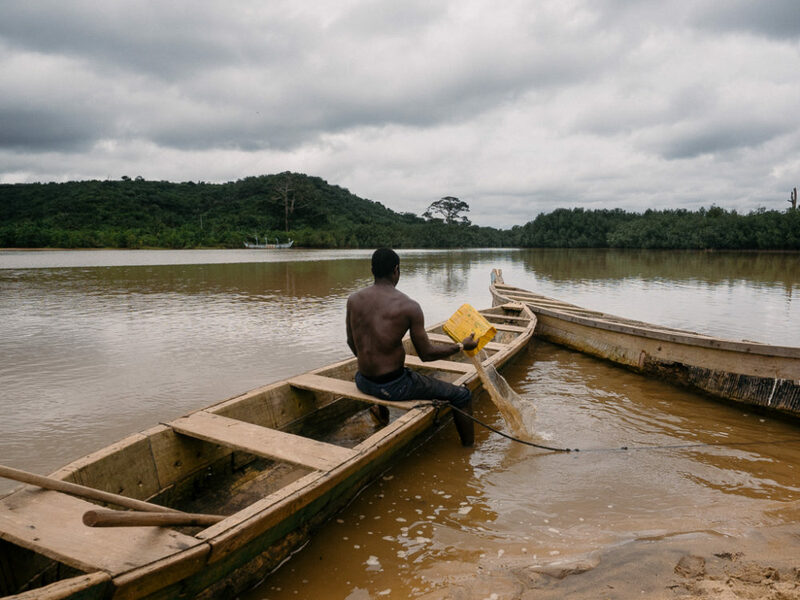 The community next to the lodge is several hundred people strong and lives predominantly from fishing. 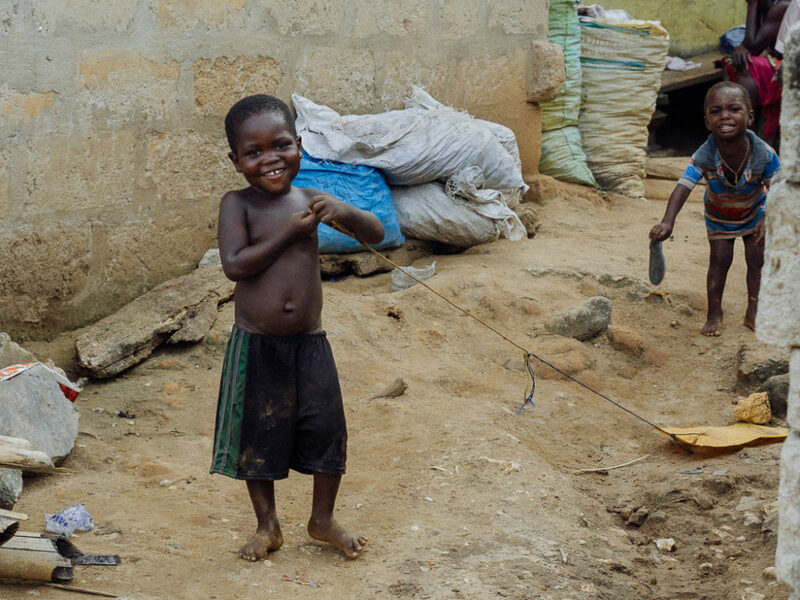 The living conditions are very basic, but as in any other place in Ghana, people do seem happy. 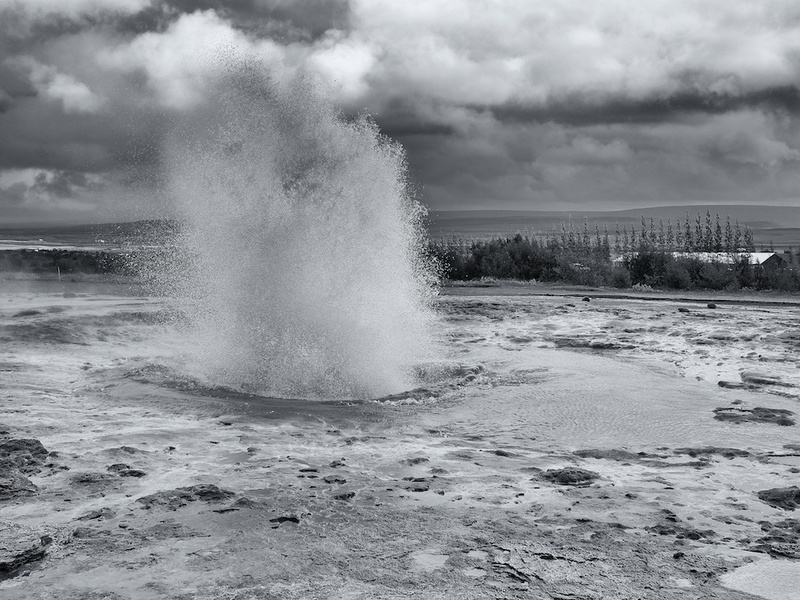 Tourism could improve the income of the people but there is a long way to go. Besides the beautiful beach there are two more attractions, the river and the castle. The village viewed from the top of Fort Batenstein on Butre hill. 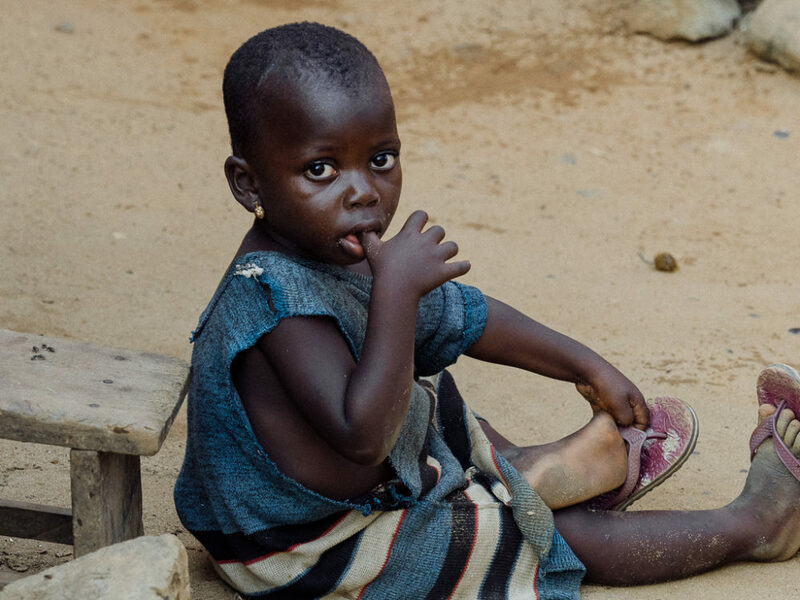 A young girl in Butre village, in Ghana. 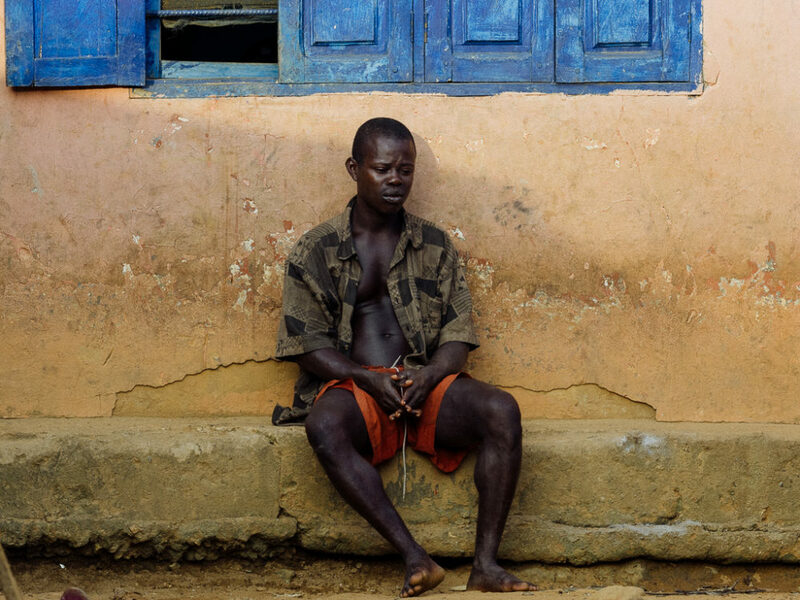 A young man resting outside his house in Butre village. 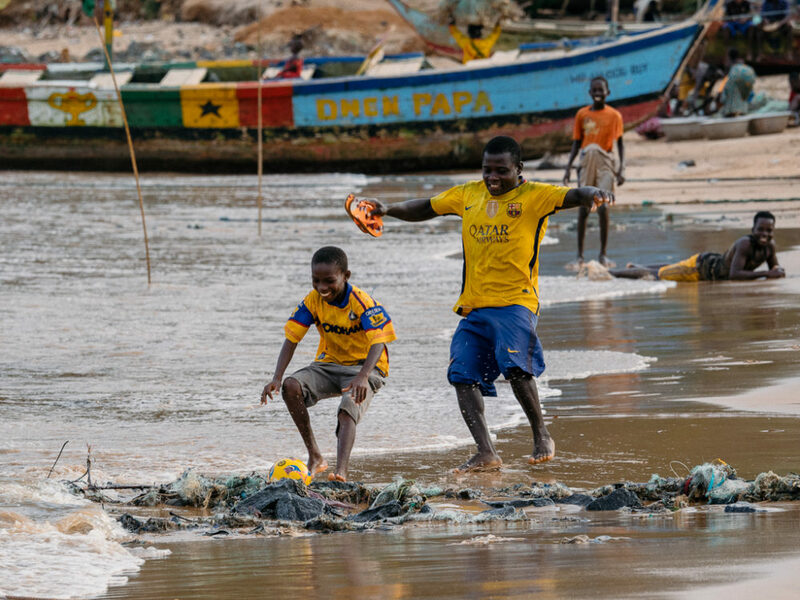 Kids playing football by the seaside in Butre village. A young guy playing in Butre village. 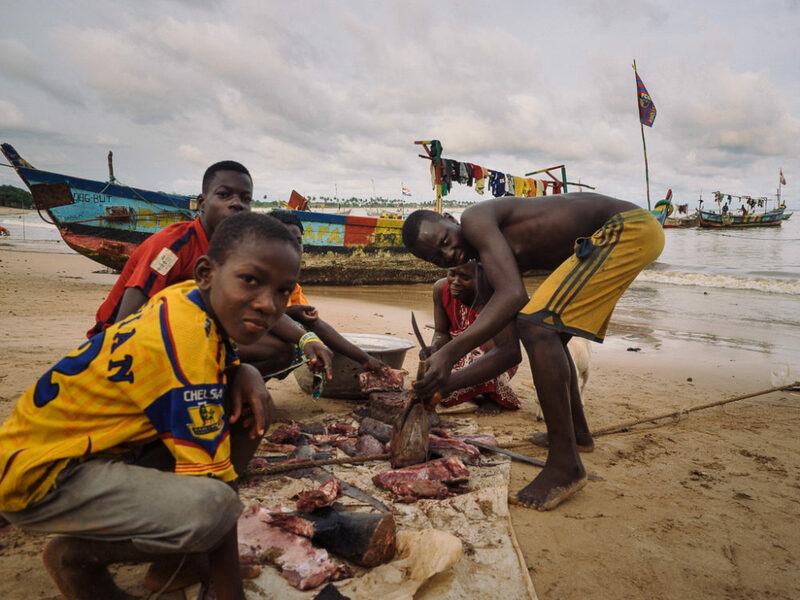 Kids cutting fish at the beach of the Butre village. 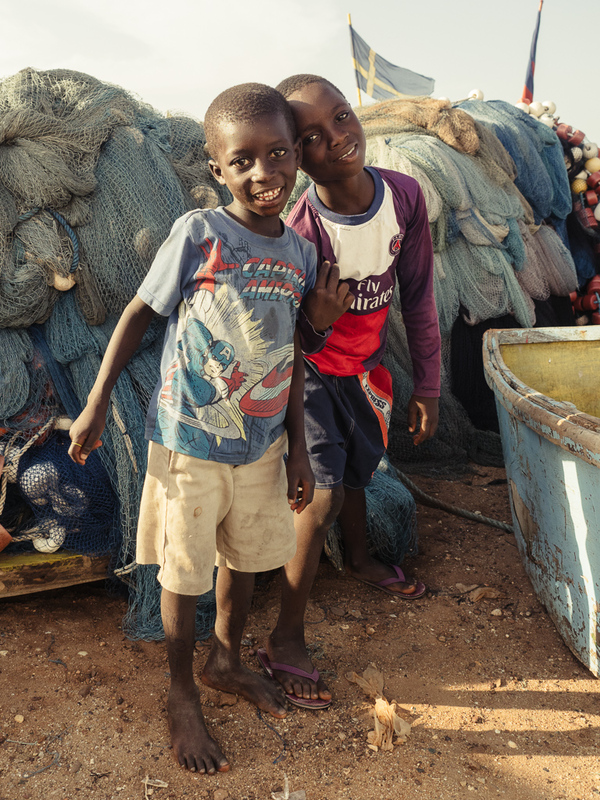 Some youngsters, happy to have their picture taken while working on their nets at Butre. Kids playing in the village of Butre. Navigating the river upstream among the mangroves, offers a good opportunity to observe the wildlife – mainly birds and amphibians – and flora of the surrounding forest. Toni emptying the water from his river boat, at Butre village. Fishing boats and nets by close to the river at Butre. 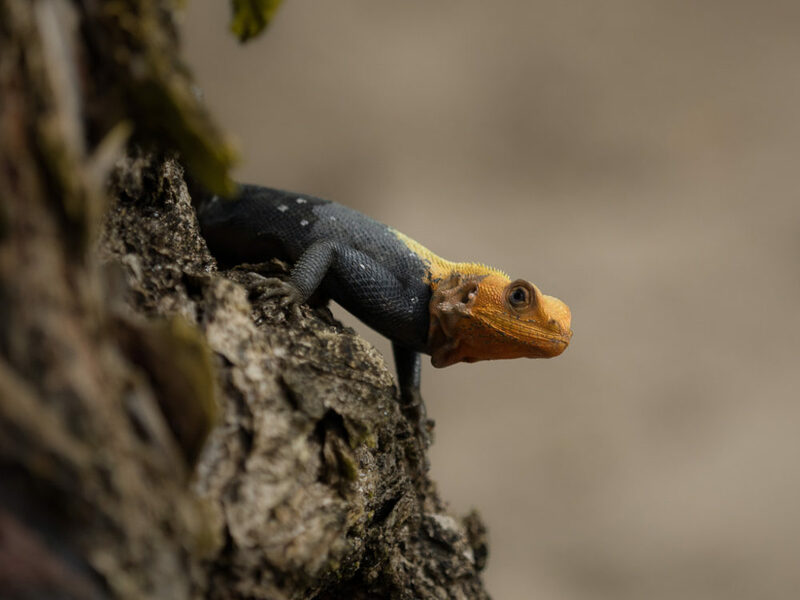 A colorful small guy at the beach in Butre. 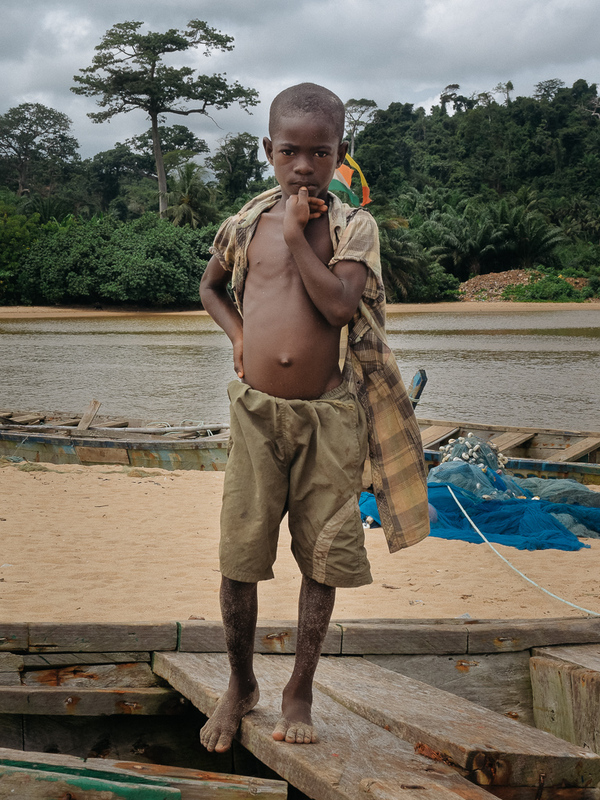 A young guy in Butre, standing on his dad's boat. The Fort Batenstine castle was built in 1649 on top of the hill behind the village and until recently it was consumed by the dense forest. Some year ago, the local people, with some external funding, cleared the vegetation and constructed a walking path for visitors. 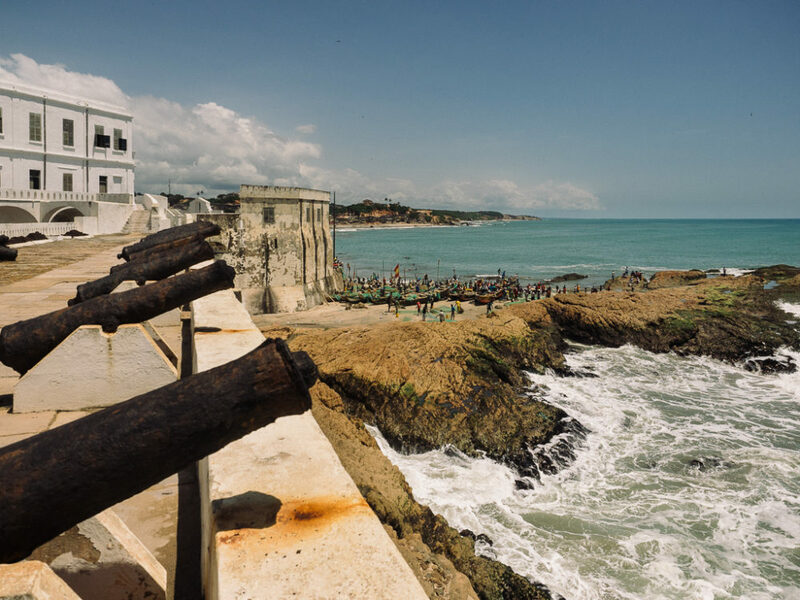 They manage to maintain it in this condition but it needs significant additional funding to restore it to the point of making it a competitive attraction to Cape Coast or Elmina castles. To visit the castle, I had to pay $10 to the local chief in person. A very polite 80-something gentleman that posed patiently for a picture in hope for some marginal publicity that could bring more people in his village and thus more money. The local chief holds titles to the entire land surrounding the community and manages all the financial affairs of the community. When I visited, he was sitting together with his two nephews and apparent heirs of the chiefdom. 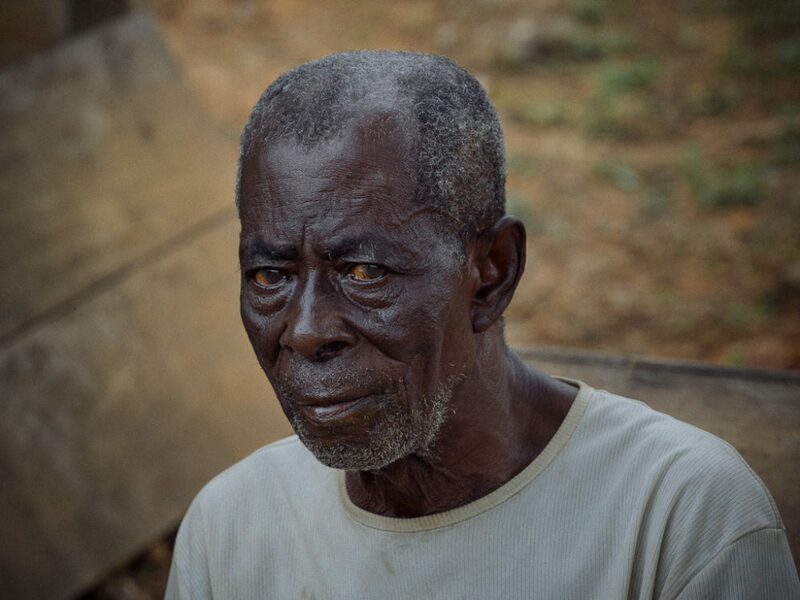 The chief of the Butre village, a polite elder that runs this community. The nephew of the chief in Butre. The two nephews of the chief in Butre. 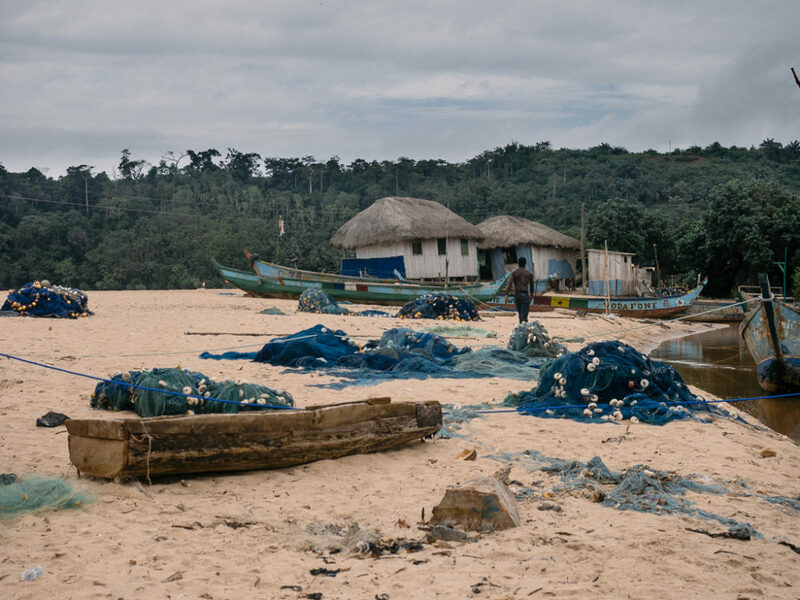 A half hour walk through the sandy beach, the other community is smaller and more isolated. 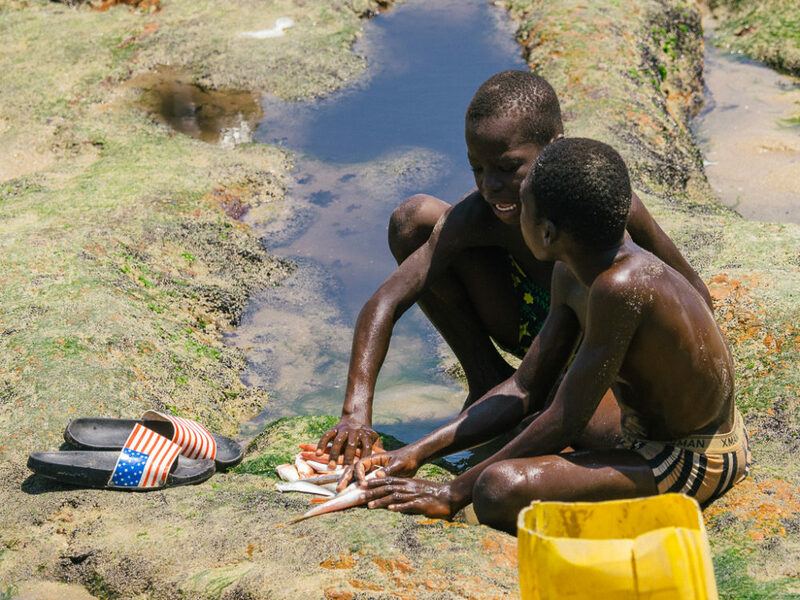 In late afternoon, after the rain, the beach front was full of fishermen unloading their nets and kids playing in the shallows. 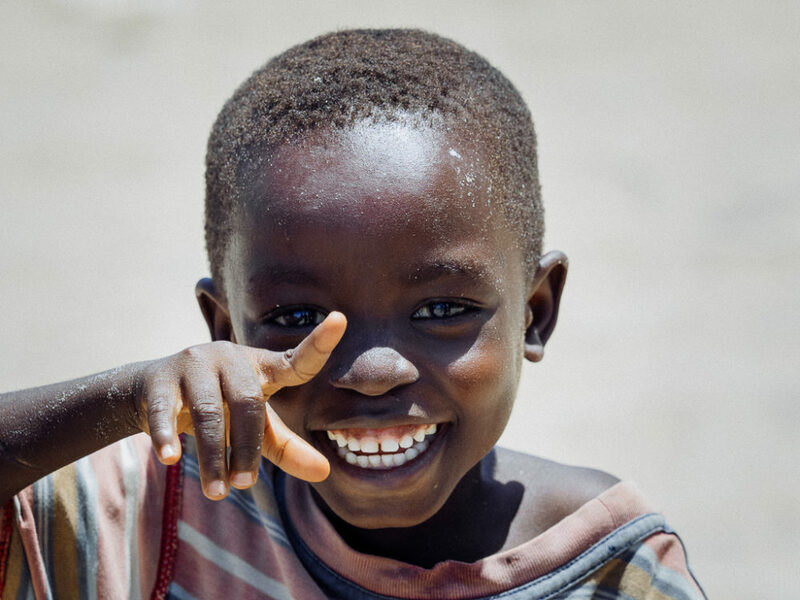 People here can be very friendly, but you definitely have to ask for permission to photograph them. A cloudy day at Butre beach. A beautiful girl and her brother in a small village at Butre beach. A guy throwing his nets in Butre. A beautiful young girl in Butre. 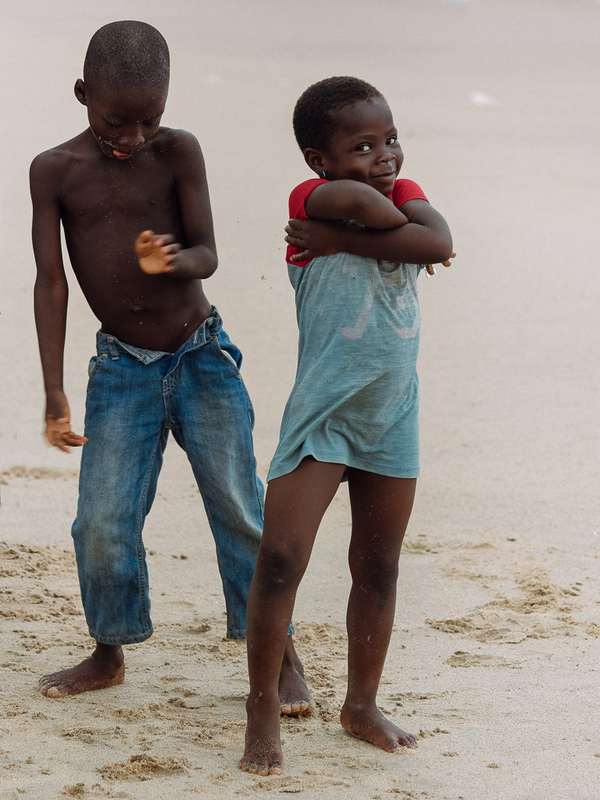 Playful kids at Butre beach. 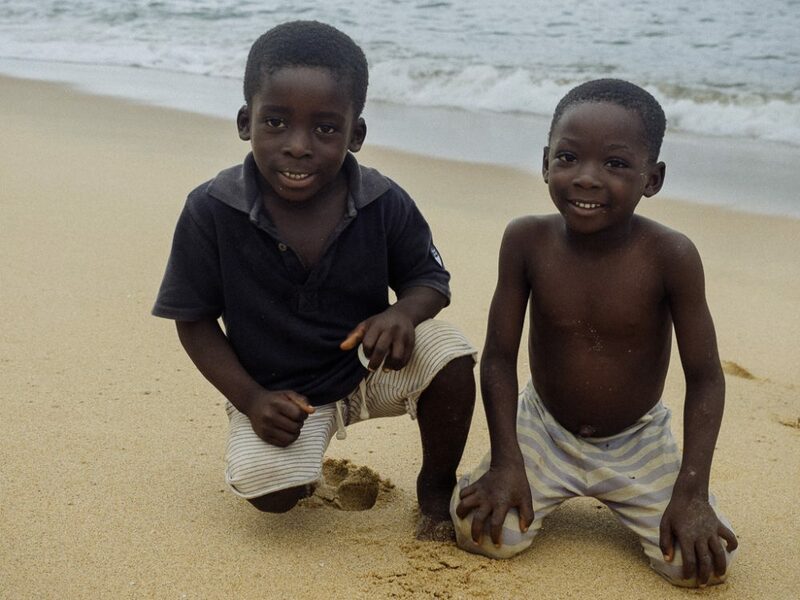 Two guys looking happy at Butre beach community. 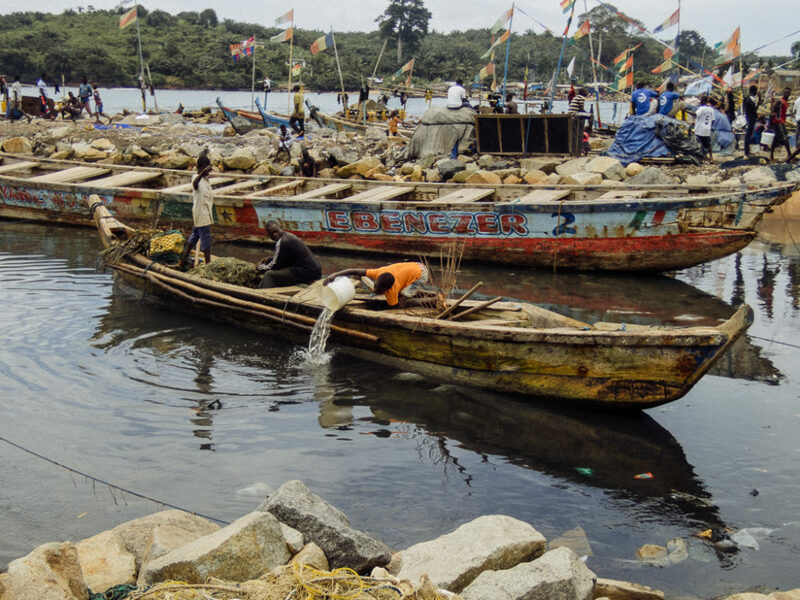 Dixcove is a buzzing fishing port next to Butre. There is no road, so to get there from Butre, so we drove up to the main road and back to the coast. 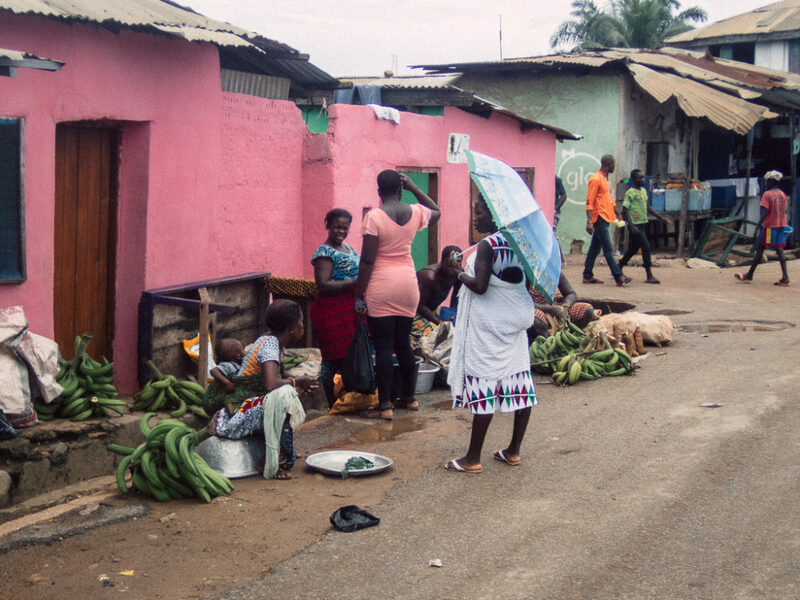 This is a small town and that offered me one of the most authentic experiences in Africa. 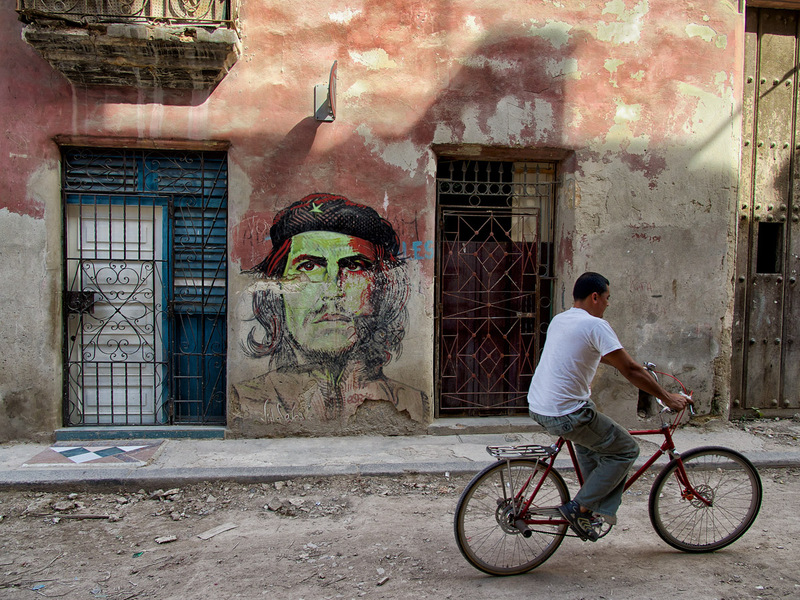 I do not mean that the town is beautiful, but it is certainly authentic. It was Sunday, so I got the chance to attain briefly the mass in the local Pentecost church. People in Ghana, as in most parts of Africa are very religious and take their Sunday mass very seriously. The living conditions in the village are rather basic and it looks dirtier than the clean fishermen communities I visited previously but I guess this is what happens when more people come together in countries that lack even the most basic of infrastructure and utilities. As in every other town on the Ghanaian cost, there is a castle. 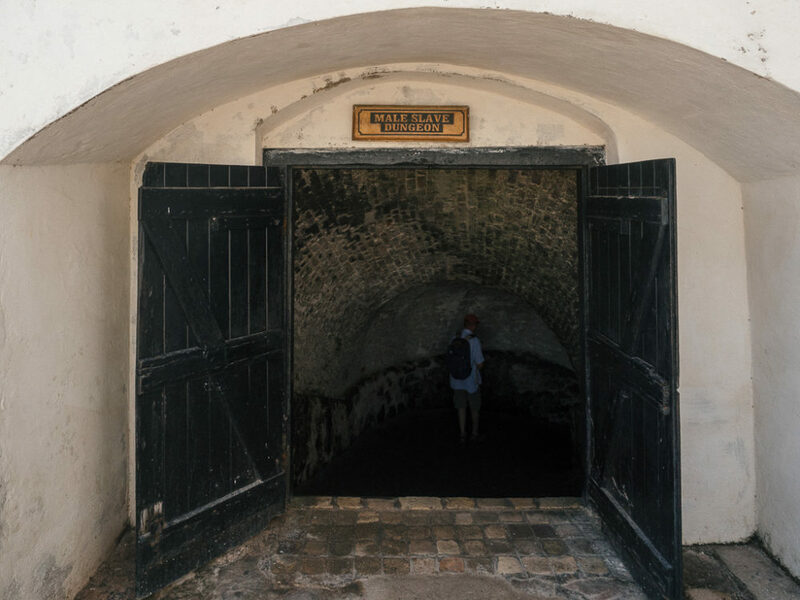 Fort Metal Cross was built in 1683 by the British for gold and slave trade. From the outside, it looks to be in pretty good condition, but unfortunately did not have the time to visit inside. The boats at the fishing port of Dixcove. The main street in Dixcove. A young lady in Dixcove. 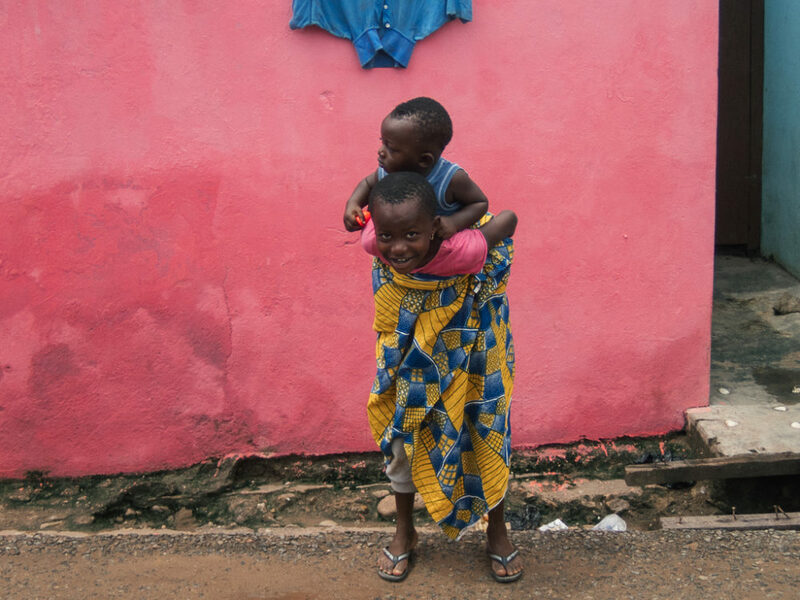 A young girl carrying her brother in Dixcove. 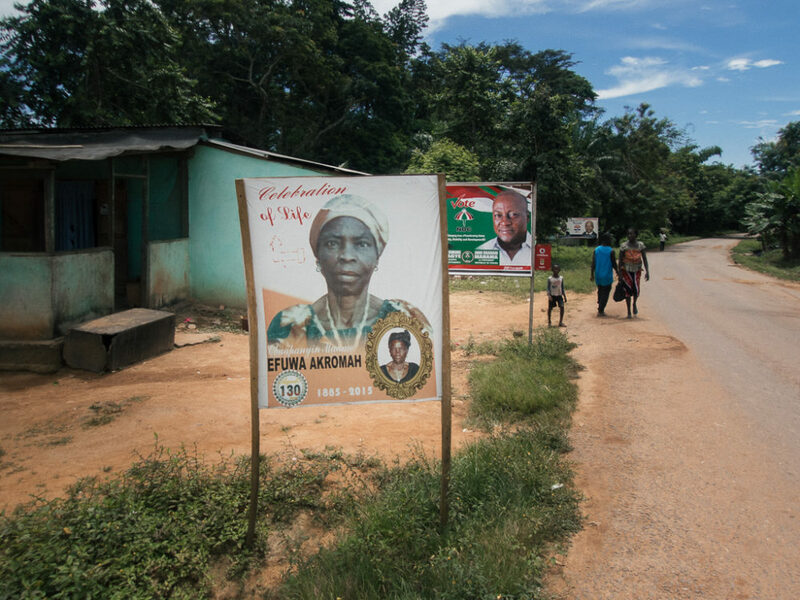 On the way back to Accra, I could not help not noticing the numerous posters on the side of the street, announcing the funeral of locals. What is amazing is the claimed life spans. On several posters I saw people over 100 years old and one that claimed 130 years! Obviously birth records are troublesome in this part of the world. One of the many posters annoucing the passing of an elder, usually claiming unbilievable lifespans. 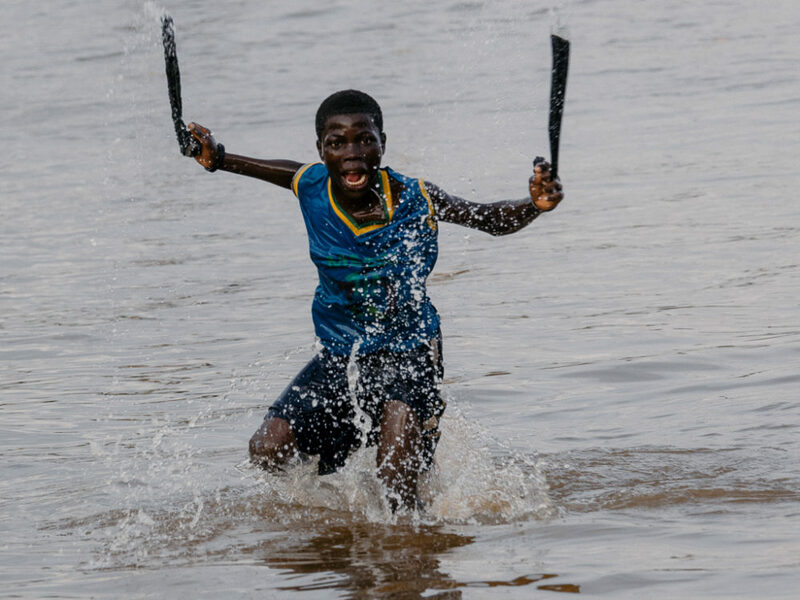 I believe that Ghana has a lot to offer to the people that want to explore the African way of life and I will definitely come back for some more exploring.